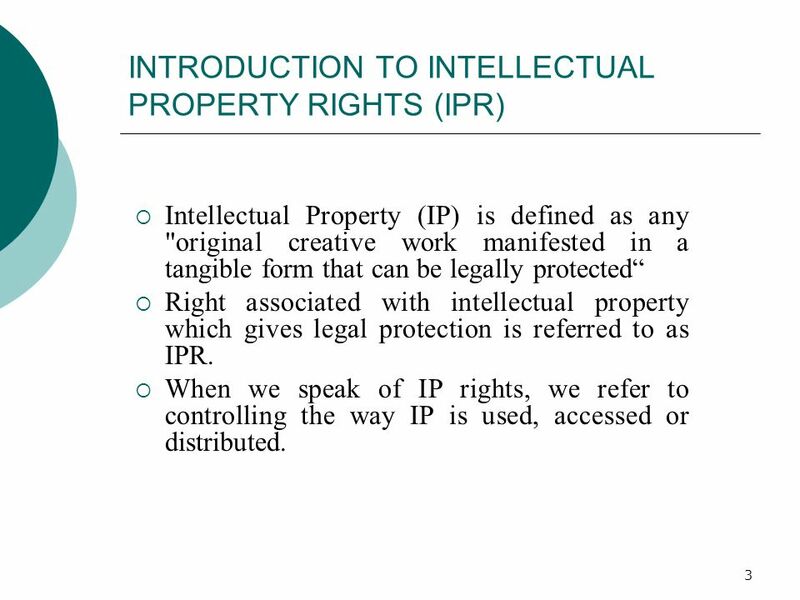 Intellectual Property (IP) is defined as any "original creative work manifested in a tangible form that can be legally protected“ Right associated with intellectual property which gives legal protection is referred to as IPR. 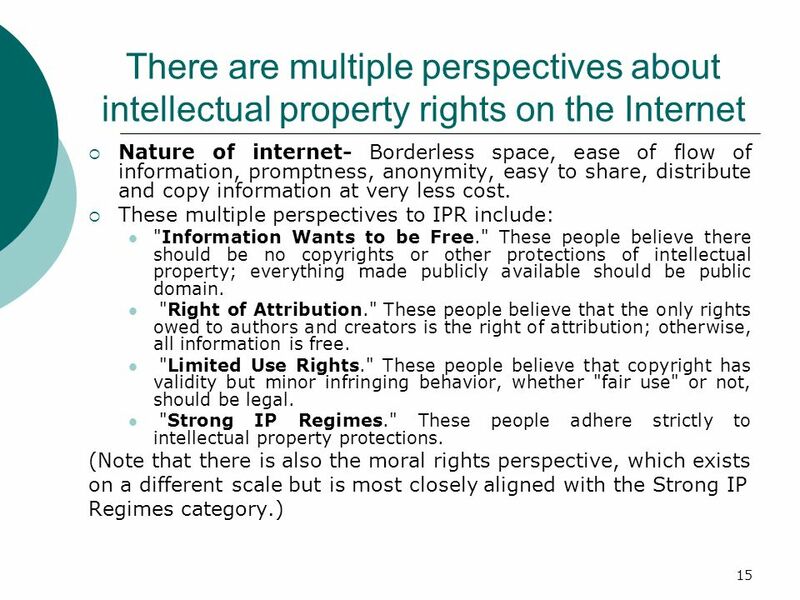 When we speak of IP rights, we refer to controlling the way IP is used, accessed or distributed. 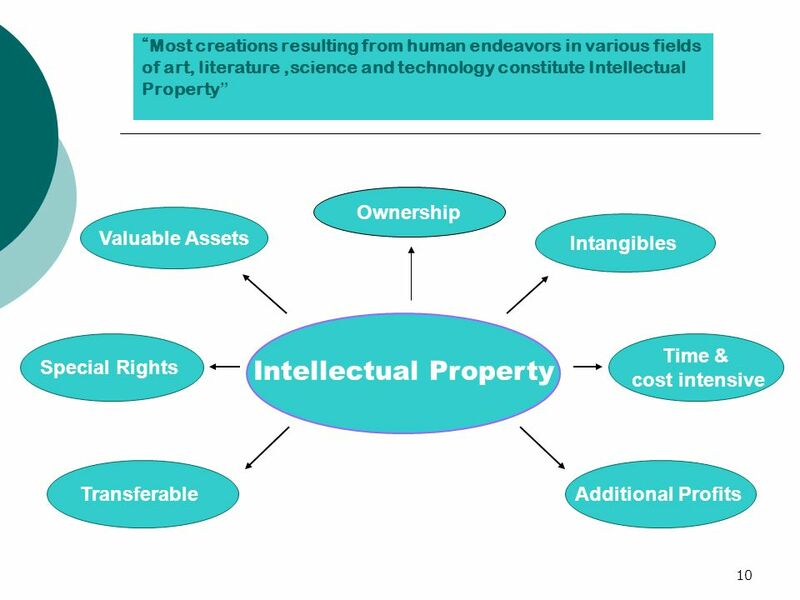 Intellectual Property can be clearly distinguished from Goodwill. UK & Australian Generally Accepted Accounting Principles (GAAP) has specified goodwill as an umbrella concept consisting of unidentifiable intangible assets and should not include those Intellectual Properties which are capable of individual identification and can be sold separately. 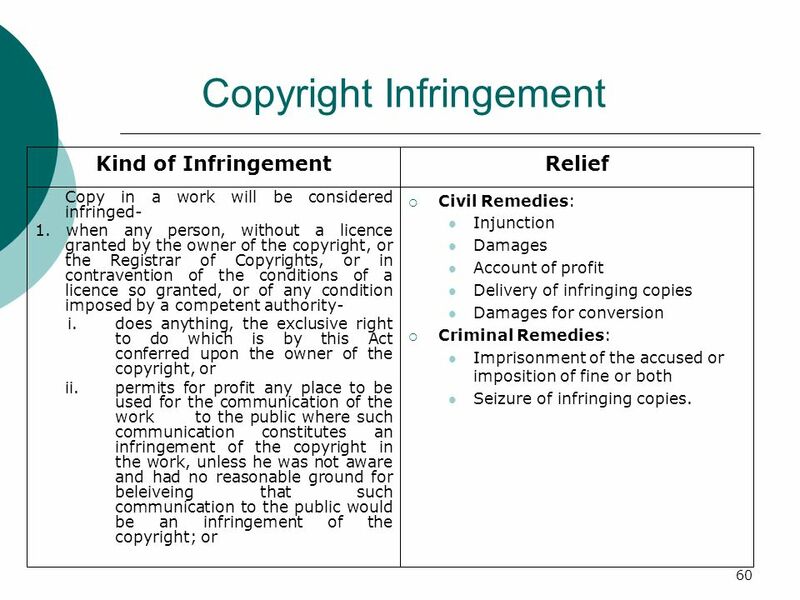 Copyright- is a bundle of rights granted to an author of an original artistic, literary or musical work to print ,publish, distribute, and sell, lease copies of his work and other allied rights. 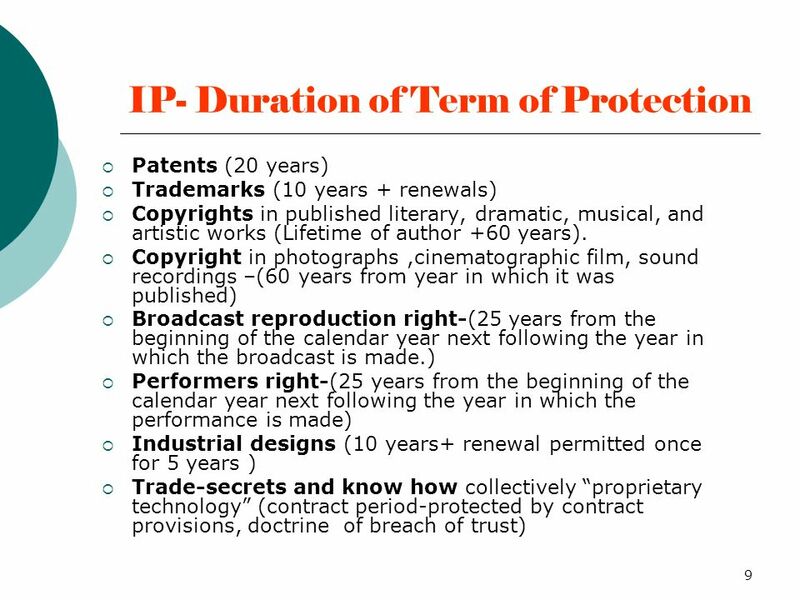 Copyright protection also extends to cinematographic film and sound recordings. Designs- The designs entitled to protection are new and original designs having aesthetic value which have not been previously known or published in India or elsewhere. 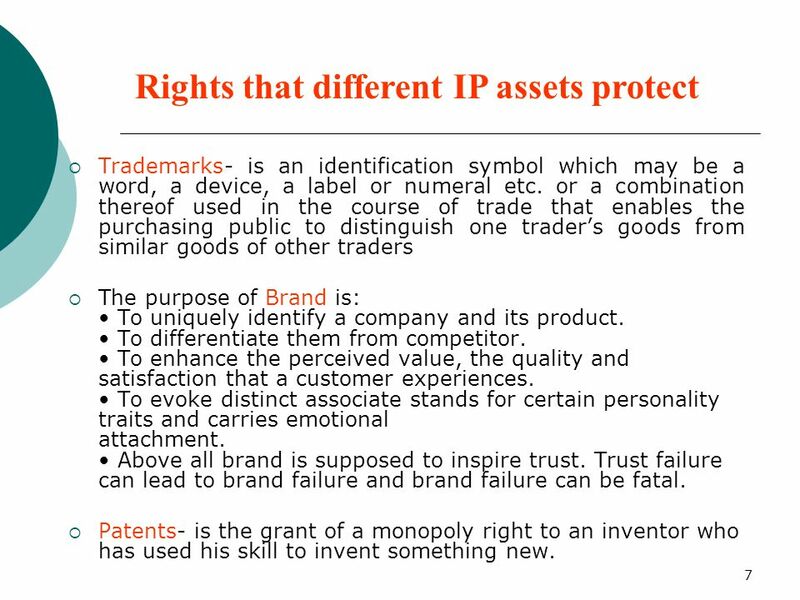 Trademarks- is an identification symbol which may be a word, a device, a label or numeral etc. or a combination thereof used in the course of trade that enables the purchasing public to distinguish one trader’s goods from similar goods of other traders The purpose of Brand is: • To uniquely identify a company and its product. • To differentiate them from competitor. • To enhance the perceived value, the quality and satisfaction that a customer experiences. • To evoke distinct associate stands for certain personality traits and carries emotional attachment. • Above all brand is supposed to inspire trust. Trust failure can lead to brand failure and brand failure can be fatal. Patents- is the grant of a monopoly right to an inventor who has used his skill to invent something new. 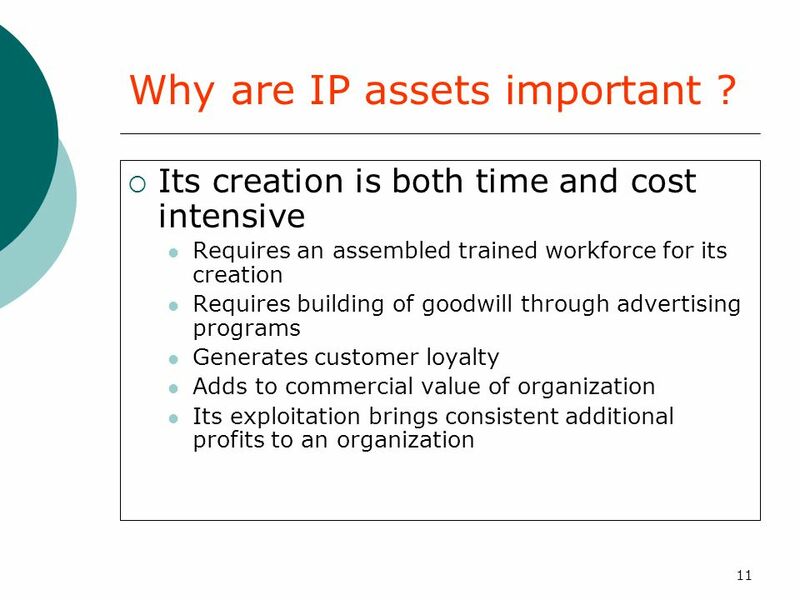 11 Why are IP assets important ? Artists and creators should be able to enjoy the fruits of their labor for a specified time period, after which the material becomes available for public use. If a business comes up with an attractive marketing logo, then no other businesses should be allowed to use that logo to promote their own products without permission. 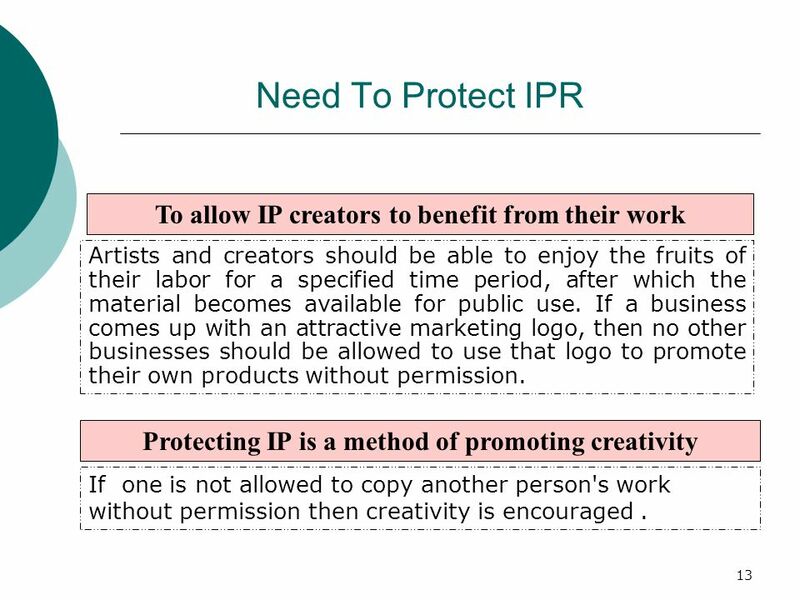 Protecting IP is a method of promoting creativity If one is not allowed to copy another person's work without permission then creativity is encouraged . 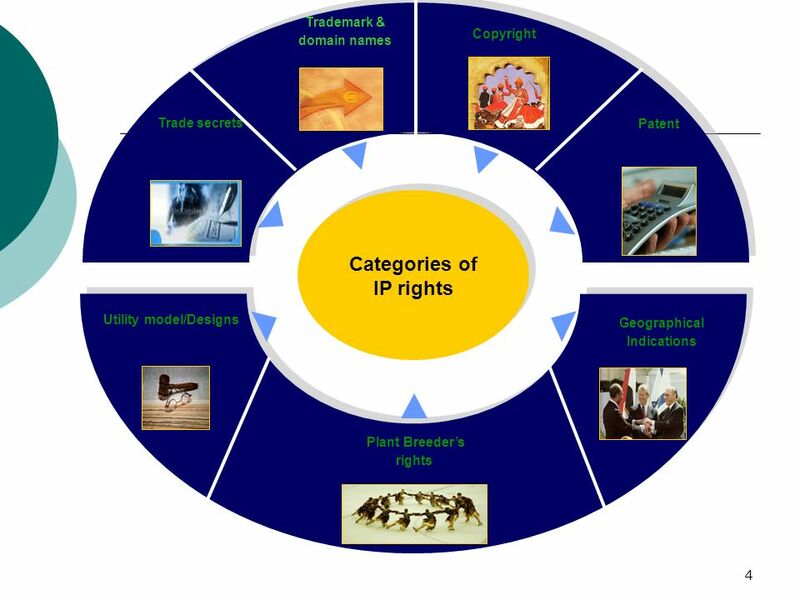 16 Concerns of protecting intellectual property. The Internet makes it possible to distribute any kind of digital information, from software to books, music, and video, instantly and at virtually no cost. The software industry has struggled with piracy since the advent of the personal computer, but as recent controversy over file-sharing systems such as Napster and Gnutella ,Aimster. ( , demonstrates, piracy is now a serious issue for any individual or business that wants to be compensated for the works they create. And since the Internet knows no borders, piracy is now a serious global problem. Strong legislation such as the Digital Millennium Copyright Act (DMCA), cooperation between nations to ensure strong enforcement of international copyright laws, innovative collaboration between content producers and the technology industry, and standards developed by organizations like the Secure Digital Music Initiative (SDMI) that can prevent or deter piracy have already made an impact on addressing this problem. But as more and more digital media becomes easy to distribute over the Internet, the government and private sector must work together to find appropriate ways to protect the rights of information consumers and producers around the world. Copyright is about protecting original expression. In contrast to traditional analog methods of recording works of intellectual property - on paper, film , on magnetic tape etc. now is the era of digitalization. Digitization converts all words, images, sounds, graphics and films into some binary numbers, either ones or zeros. These digitally stored works, disassociated from their physical form, are then transferred over the networks to be finally reconstructed into recognizable art by a reference to their binary values. This transformation represents that we are no longer transferring fixed expression of works as we would buy a book or license a video, but the digital representation of those works. This liberation of works from their form or media, calls for a change in the way that we protect and enforce intellectual property rights and copyright in particular. With the advent of digital technology some new types of work came into being and questions arose about how, and to what extent, they should be protected: Computer programs have some of the characteristics of a literary work but are not written to be read directly by another person; rather a computer program is a set of instructions for a machine. European approach-to be patentable it should lead to a technical effect. A technical contribution typically means a further technical effect that goes beyond the normal physical interaction between the program and the computer. 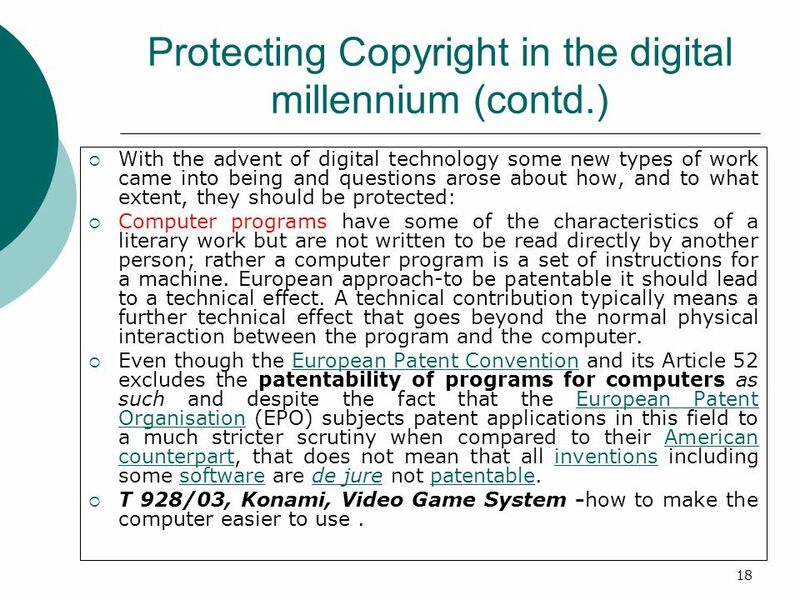 Even though the European Patent Convention and its Article 52 excludes the patentability of programs for computers as such and despite the fact that the European Patent Organisation (EPO) subjects patent applications in this field to a much stricter scrutiny when compared to their American counterpart, that does not mean that all inventions including some software are de jure not patentable. T 928/03, Konami, Video Game System -how to make the computer easier to use . 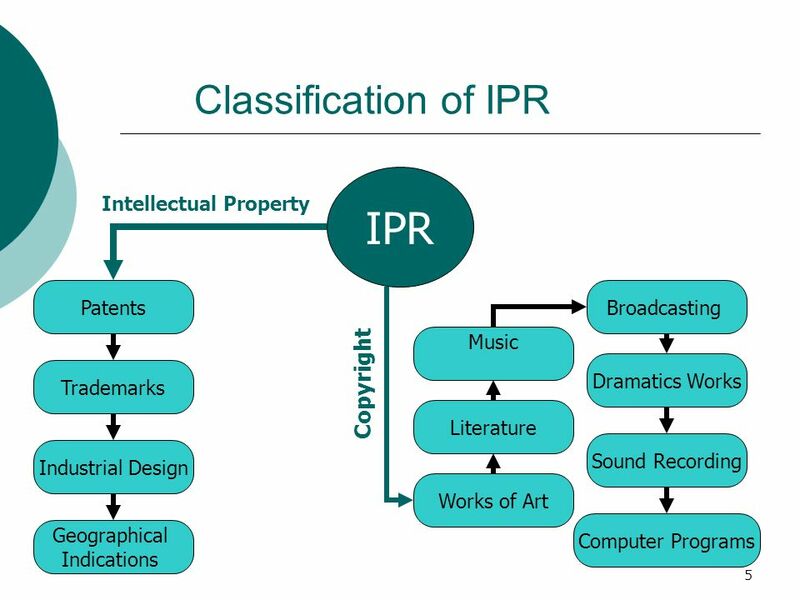 Section 14 Copyright Act,1957 To fix information in any tangible form To reproduce copyrighted work To sell, rent, lease or otherwise distribute copies Perform and display copyrighted work To prepare derivatives of a copyrighted work. MAI systems corp v Peak computer 991F2d511(9th circuit 1993) Copyright owner of OS software sued a computer repair company for infringement, based on repair company’s turning on a computer running the OS for servicing the machine. In doing so, the defendant was able to view the software program to assist him in diagnosing the problem. 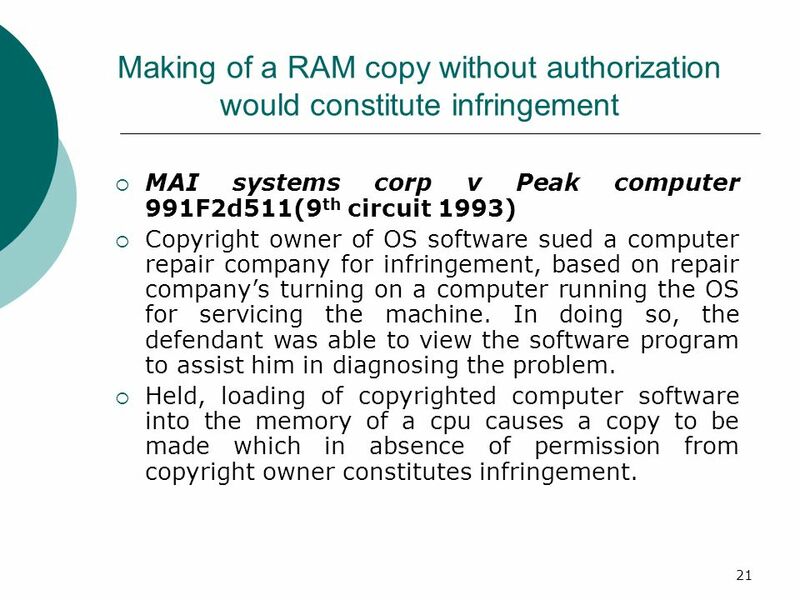 Held, loading of copyrighted computer software into the memory of a cpu causes a copy to be made which in absence of permission from copyright owner constitutes infringement. 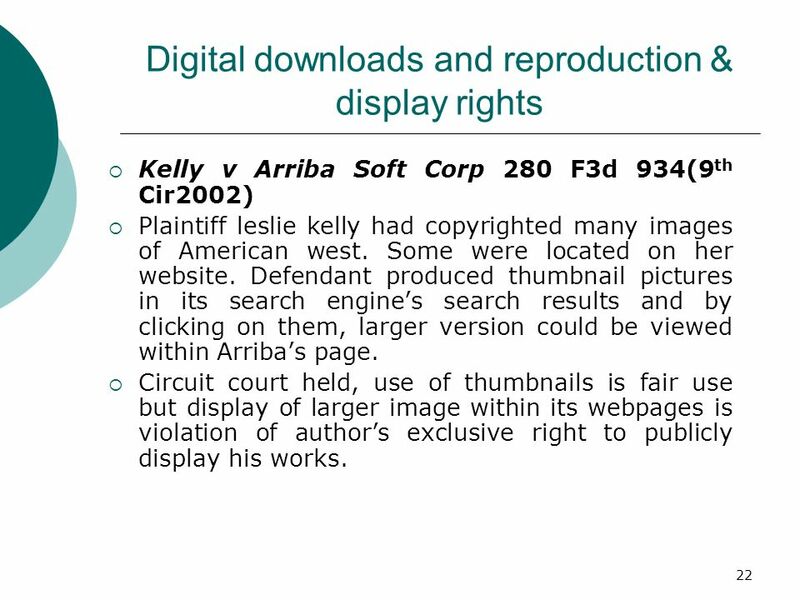 Kelly v Arriba Soft Corp 280 F3d 934(9th Cir2002) Plaintiff leslie kelly had copyrighted many images of American west. Some were located on her website. Defendant produced thumbnail pictures in its search engine’s search results and by clicking on them, larger version could be viewed within Arriba’s page. Circuit court held, use of thumbnails is fair use but display of larger image within its webpages is violation of author’s exclusive right to publicly display his works. The MP3 revolution The Napster story P2P file sharing technology facilitates 1-store MP3 music files on individual computer hard drives available for copying by other Napster users 2-search for MP3 music files stored on other users computers and 3-transfer exact copies of the contents of other users MP3 files from one computer to another via the Internet. Napster free of charge music share software ,napster internet site. It provided technical support for indexing and searching of MP3 files also.-complaint for being contributory and vicarious copyright infringer. 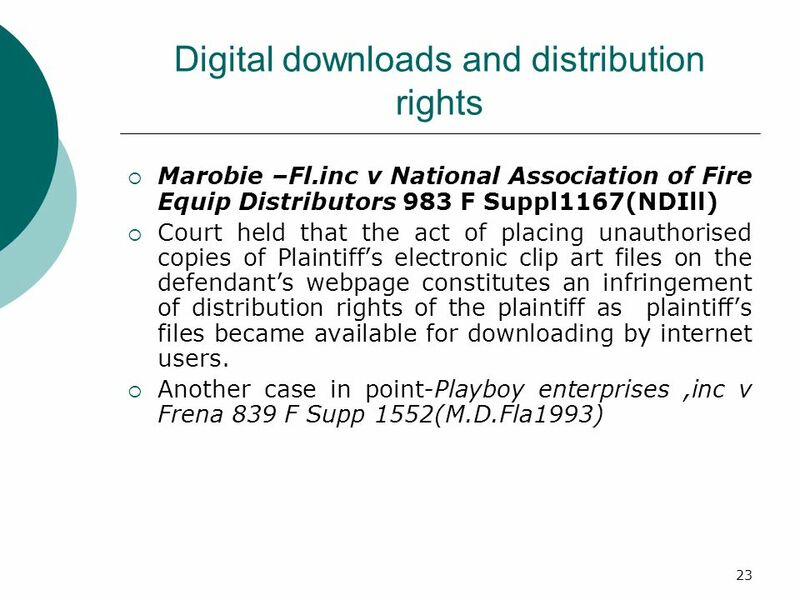 Napster used fair use defence. 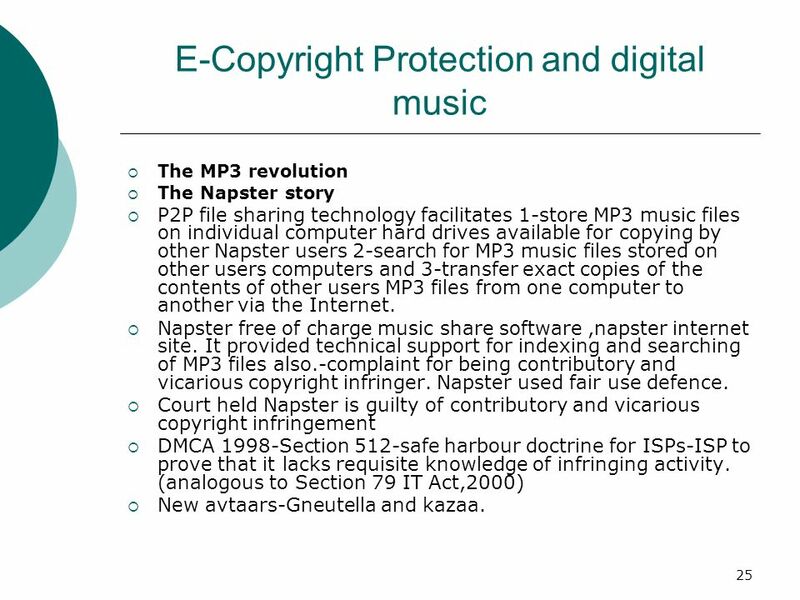 Court held Napster is guilty of contributory and vicarious copyright infringement DMCA 1998-Section 512-safe harbour doctrine for ISPs-ISP to prove that it lacks requisite knowledge of infringing activity. (analogous to Section 79 IT Act,2000) New avtaars-Gneutella and kazaa. 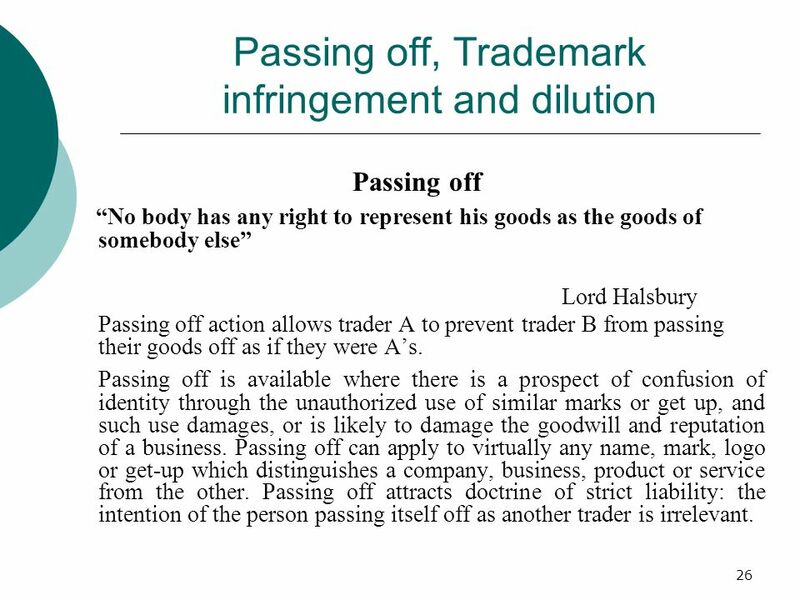 “No body has any right to represent his goods as the goods of somebody else” Lord Halsbury Passing off action allows trader A to prevent trader B from passing their goods off as if they were A’s. Passing off is available where there is a prospect of confusion of identity through the unauthorized use of similar marks or get up, and such use damages, or is likely to damage the goodwill and reputation of a business. Passing off can apply to virtually any name, mark, logo or get-up which distinguishes a company, business, product or service from the other. Passing off attracts doctrine of strict liability: the intention of the person passing itself off as another trader is irrelevant. 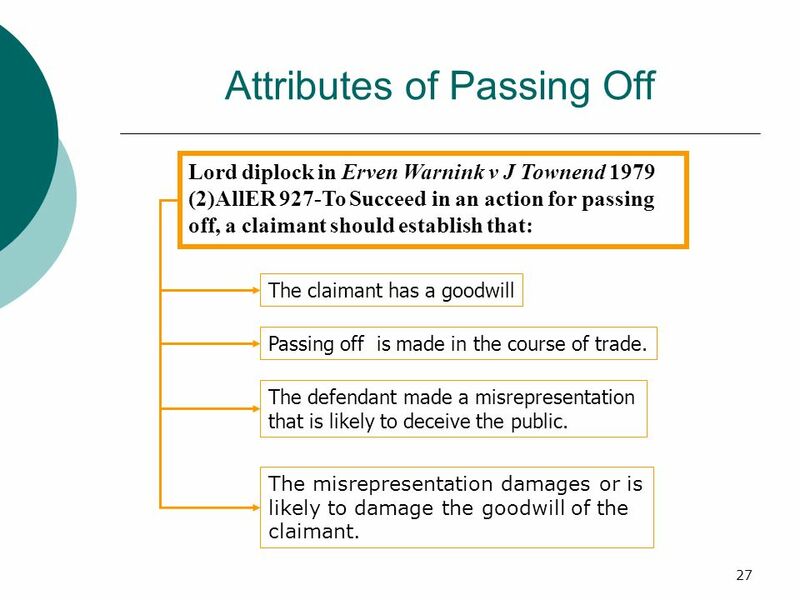 Lord diplock in Erven Warnink v J Townend 1979 (2)AllER 927-To Succeed in an action for passing off, a claimant should establish that: The claimant has a goodwill Passing off is made in the course of trade. The defendant made a misrepresentation that is likely to deceive the public. The misrepresentation damages or is likely to damage the goodwill of the claimant. Domain name similar to that of known companies are used by persons in order to promote their products or services. 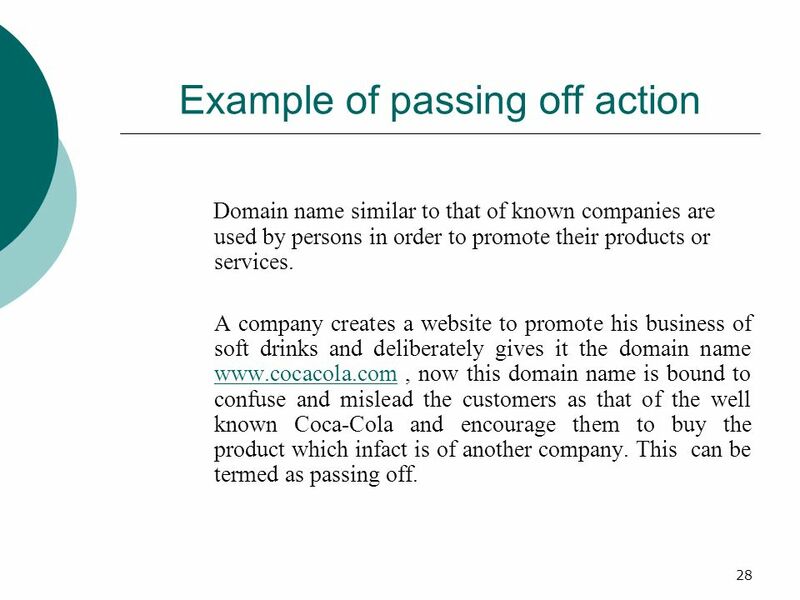 A company creates a website to promote his business of soft drinks and deliberately gives it the domain name , now this domain name is bound to confuse and mislead the customers as that of the well known Coca-Cola and encourage them to buy the product which infact is of another company. This can be termed as passing off. Cases on Passing off Yahoo! 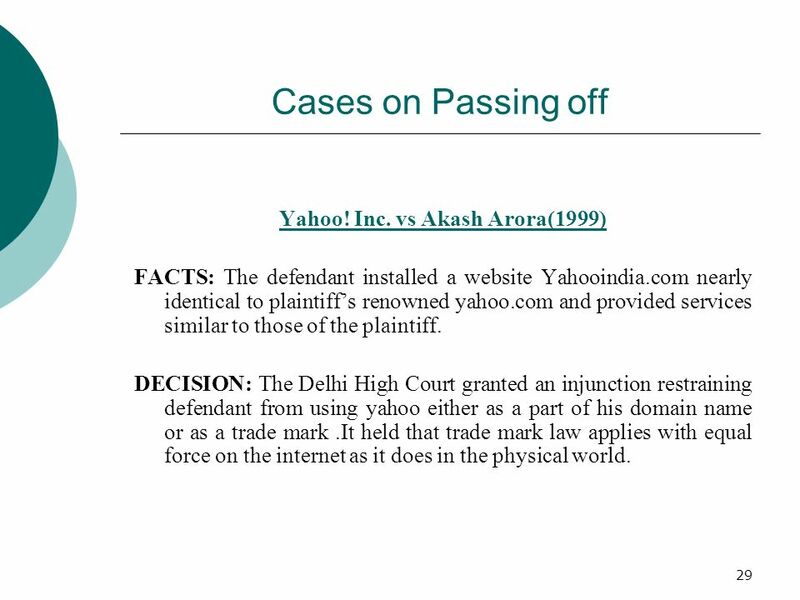 Inc. vs Akash Arora(1999) FACTS: The defendant installed a website Yahooindia.com nearly identical to plaintiff’s renowned yahoo.com and provided services similar to those of the plaintiff. DECISION: The Delhi High Court granted an injunction restraining defendant from using yahoo either as a part of his domain name or as a trade mark .It held that trade mark law applies with equal force on the internet as it does in the physical world. 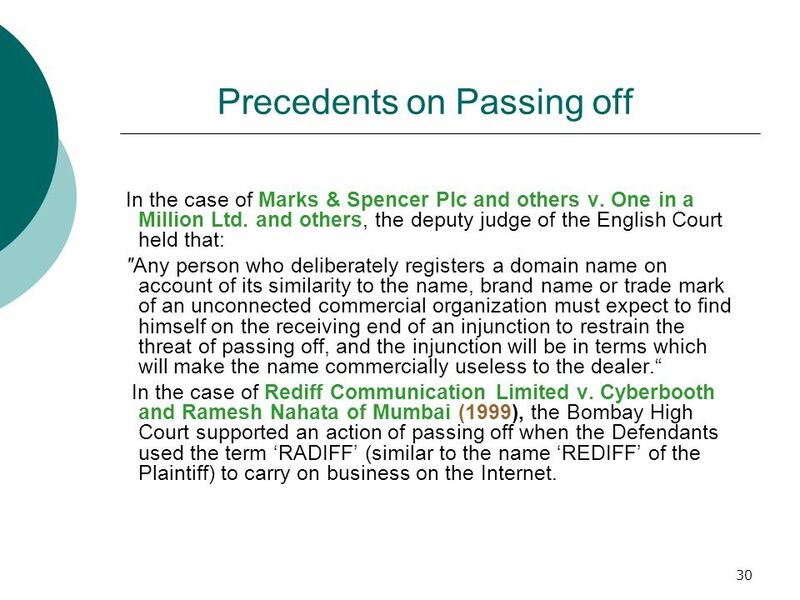 In the case of Marks & Spencer Plc and others v. One in a Million Ltd. and others, the deputy judge of the English Court held that: "Any person who deliberately registers a domain name on account of its similarity to the name, brand name or trade mark of an unconnected commercial organization must expect to find himself on the receiving end of an injunction to restrain the threat of passing off, and the injunction will be in terms which will make the name commercially useless to the dealer.“ In the case of Rediff Communication Limited v. Cyberbooth and Ramesh Nahata of Mumbai (1999), the Bombay High Court supported an action of passing off when the Defendants used the term ‘RADIFF’ (similar to the name ‘REDIFF’ of the Plaintiff) to carry on business on the Internet. 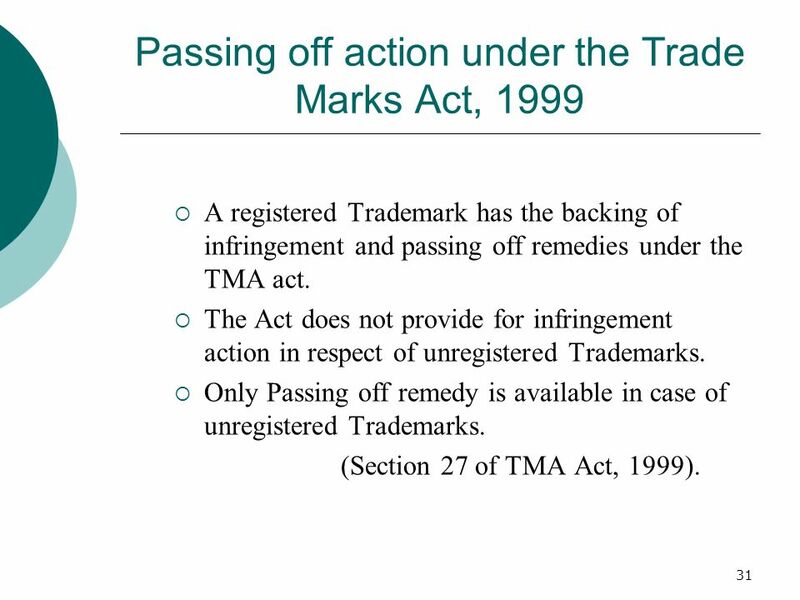 A registered Trademark has the backing of infringement and passing off remedies under the TMA act. 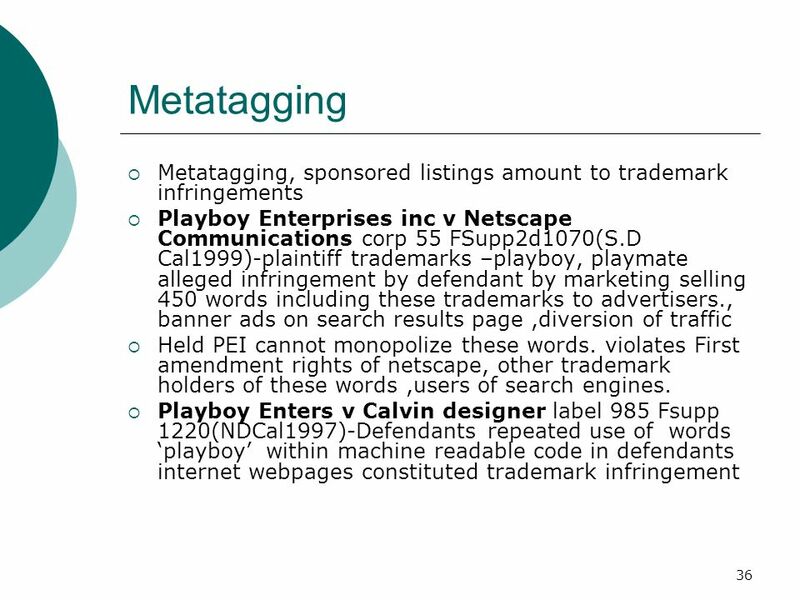 The Act does not provide for infringement action in respect of unregistered Trademarks. Only Passing off remedy is available in case of unregistered Trademarks. (Section 27 of TMA Act, 1999). Section 29 of the Trademark Act states that when a registered trade mark is used by a person who is not entitled to use such a trade mark under the law, it constitutes infringement. A registered trade mark is infringed ,if:- 1. The mark is identical and is used in respect of similar goods or services or 2. The mark is similar to the registered trade mark and there is an identity or similarity of the goods or services covered by the trade mark 3. And Such use is likely to cause confusion on the part of the public or is likely to be taken to have association with the registered trade mark. 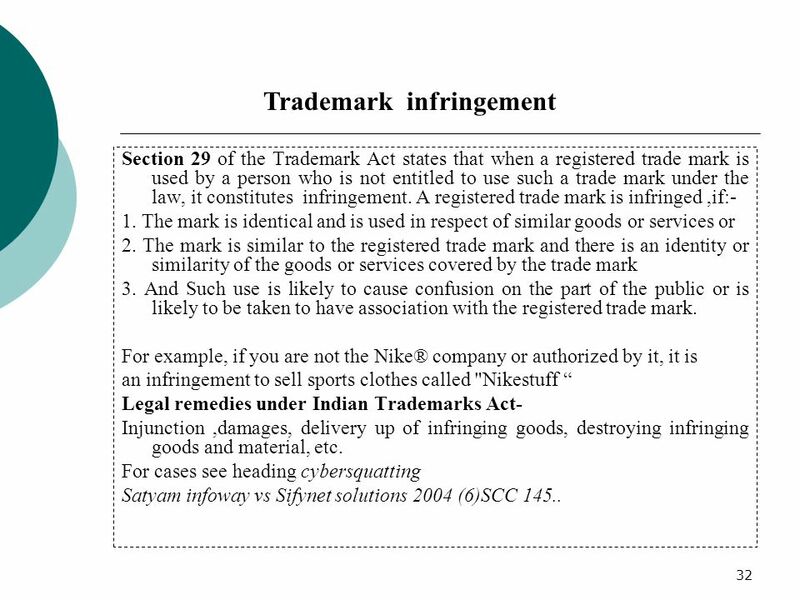 For example, if you are not the Nike® company or authorized by it, it is an infringement to sell sports clothes called "Nikestuff “ Legal remedies under Indian Trademarks Act- Injunction ,damages, delivery up of infringing goods, destroying infringing goods and material, etc. 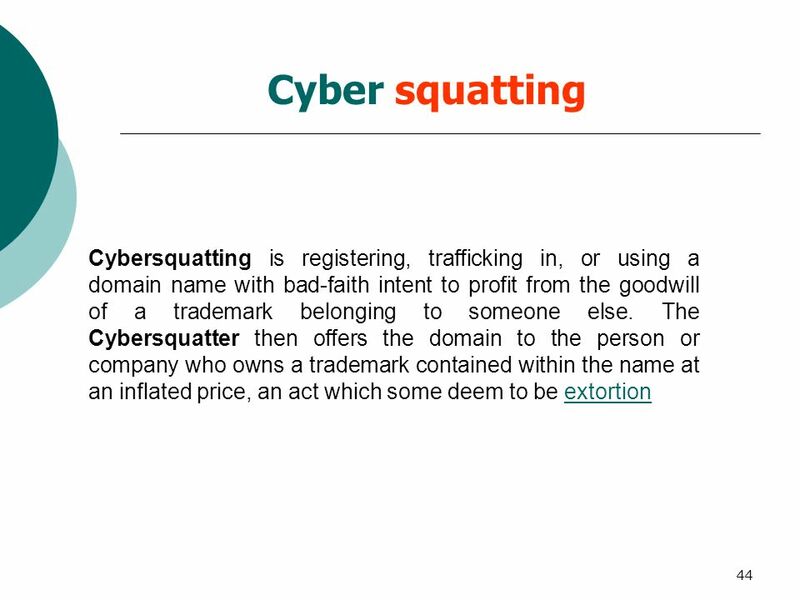 For cases see heading cybersquatting Satyam infoway vs Sifynet solutions 2004 (6)SCC 145..
33 Dilution Dilution is a trademark law concept forbidding the use of a famous trademark in a way that would lessen its uniqueness. In most cases, trademark dilution involves an unauthorized use of another's trademark on products that do not compete with, and have little connection with, those of the trademark owner. For example, a famous trademark used by one company to refer to hair care products, might be diluted if another company began using a similar mark to refer to breakfast cereals or spark plugs. A trademark is diluted when the use of similar or identical trademarks in other non-competing markets means that the trademark in and of itself will lose its capacity to signify a single source. In other words, unlike ordinary trademark law, dilution protection extends to trademark uses that do not confuse consumers regarding who has made a product. 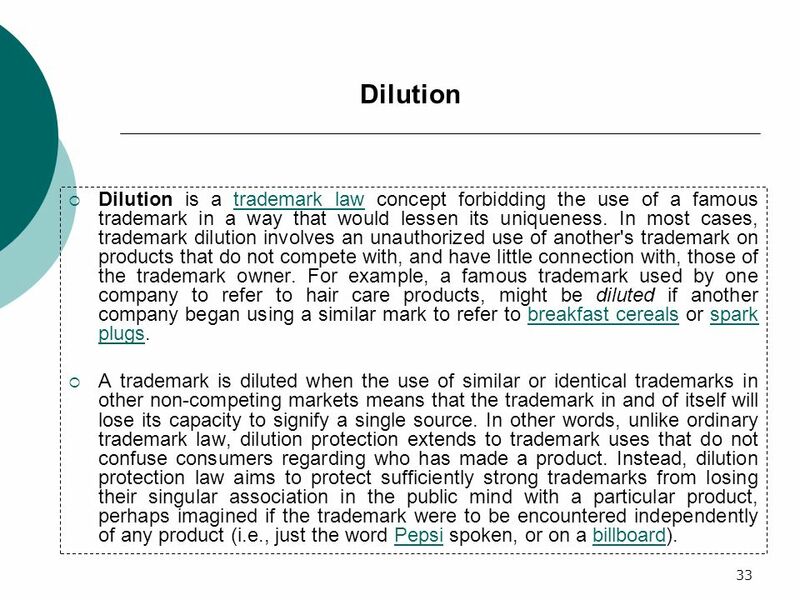 Instead, dilution protection law aims to protect sufficiently strong trademarks from losing their singular association in the public mind with a particular product, perhaps imagined if the trademark were to be encountered independently of any product (i.e., just the word Pepsi spoken, or on a billboard). 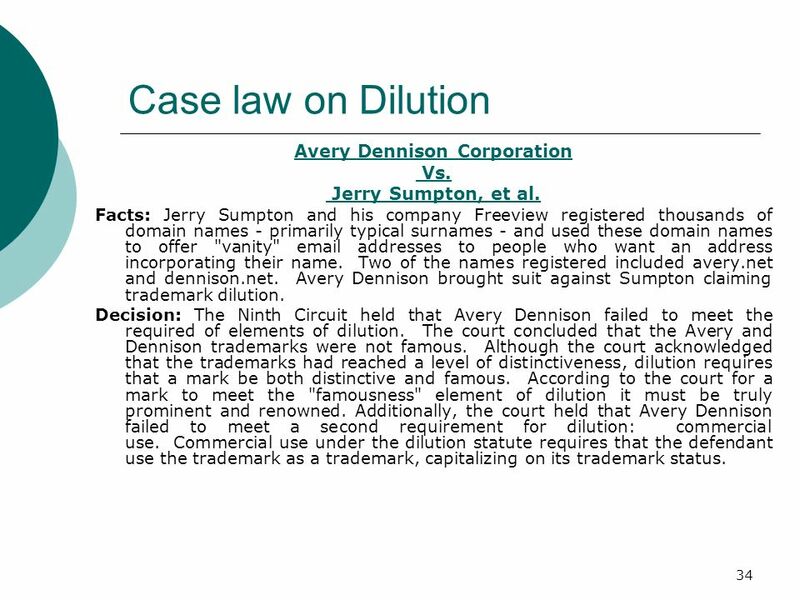 Case law on Dilution Avery Dennison Corporation Vs. Jerry Sumpton, et al. Facts: Jerry Sumpton and his company Freeview registered thousands of domain names - primarily typical surnames - and used these domain names to offer "vanity" addresses to people who want an address incorporating their name. Two of the names registered included avery.net and dennison.net. Avery Dennison brought suit against Sumpton claiming trademark dilution. Decision: The Ninth Circuit held that Avery Dennison failed to meet the required of elements of dilution. The court concluded that the Avery and Dennison trademarks were not famous. Although the court acknowledged that the trademarks had reached a level of distinctiveness, dilution requires that a mark be both distinctive and famous. According to the court for a mark to meet the "famousness" element of dilution it must be truly prominent and renowned. Additionally, the court held that Avery Dennison failed to meet a second requirement for dilution: commercial use. Commercial use under the dilution statute requires that the defendant use the trademark as a trademark, capitalizing on its trademark status. 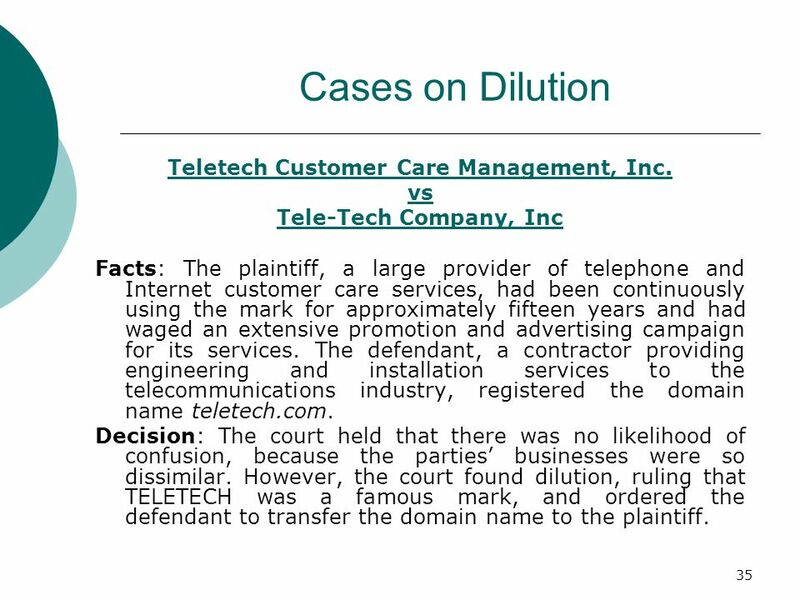 35 Teletech Customer Care Management, Inc.
Cases on Dilution Teletech Customer Care Management, Inc. vs Tele-Tech Company, Inc Facts: The plaintiff, a large provider of telephone and Internet customer care services, had been continuously using the mark for approximately fifteen years and had waged an extensive promotion and advertising campaign for its services. The defendant, a contractor providing engineering and installation services to the telecommunications industry, registered the domain name teletech.com. Decision: The court held that there was no likelihood of confusion, because the parties’ businesses were so dissimilar. However, the court found dilution, ruling that TELETECH was a famous mark, and ordered the defendant to transfer the domain name to the plaintiff. 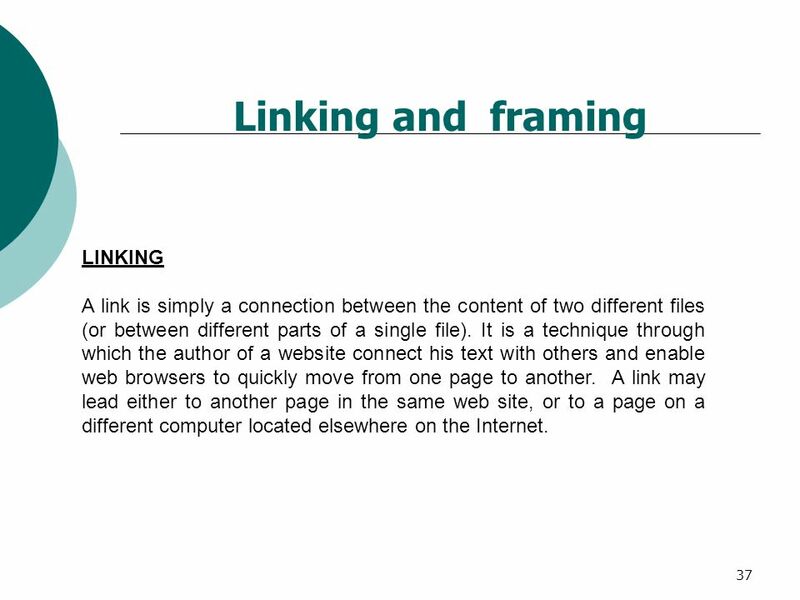 A link is simply a connection between the content of two different files (or between different parts of a single file). It is a technique through which the author of a website connect his text with others and enable web browsers to quickly move from one page to another. 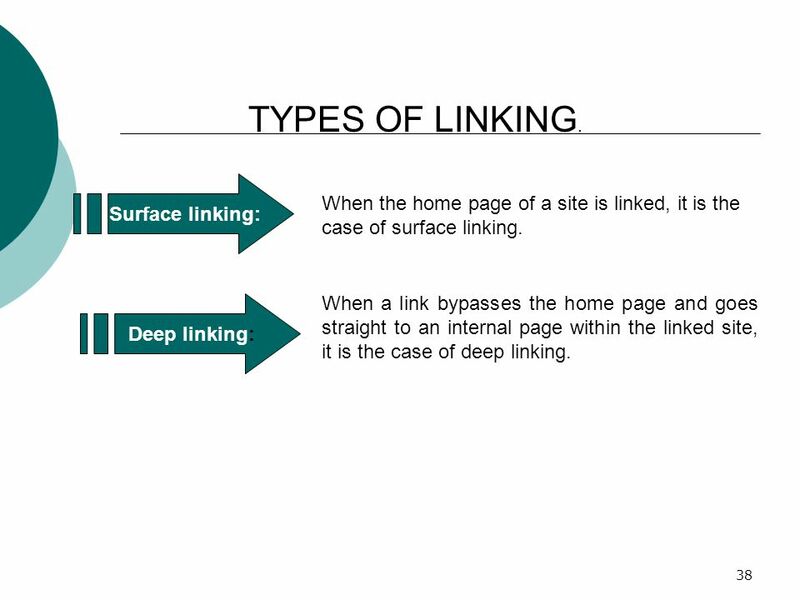 A link may lead either to another page in the same web site, or to a page on a different computer located elsewhere on the Internet. PRECEDENT ON LINKING Ticketmaster vs. Microsoft Facts: In April, 1997, Ticketmaster filed a complaint in federal court in the Central District of California alleging that "Microsoft's actions diluted their trademarks; created a false, deceptive and misleading representation that there was a formal relationship between the two of them; constituted unfair competition and business practices; and constituted a commercial misuse of their trademarks.“ Microsoft at that time operated Sidewalk, a recreational and cultural guide Web site. What Microsoft was doing was simple -- if a Sidewalk user wanted to buy a ticket to a particular event mentioned on the site, Sidewalk offered them a link to Ticketmaster's ticket purchase page. They were actually promoting Ticketmaster sales and sending them customers. A month after the suit was filed; Ticketmaster blocked Sidewalk users from their site. 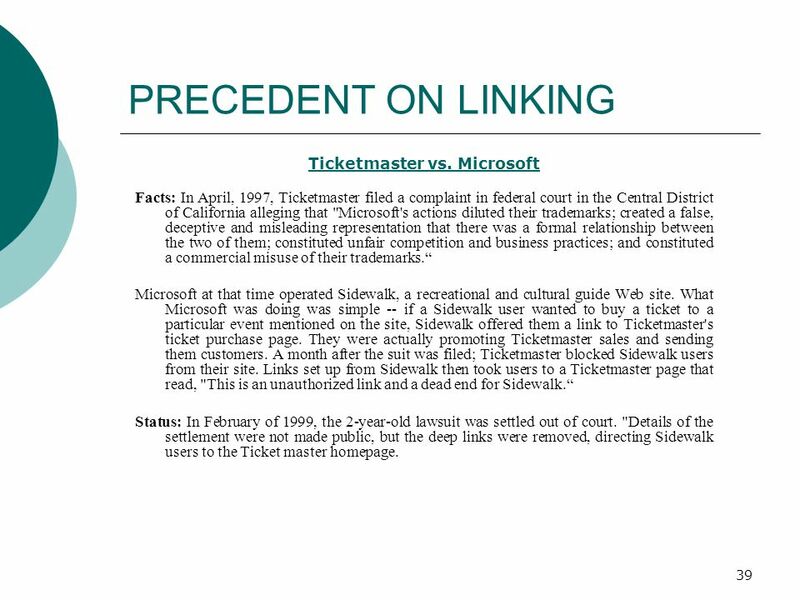 Links set up from Sidewalk then took users to a Ticketmaster page that read, "This is an unauthorized link and a dead end for Sidewalk.“ Status: In February of 1999, the 2-year-old lawsuit was settled out of court. "Details of the settlement were not made public, but the deep links were removed, directing Sidewalk users to the Ticket master homepage. 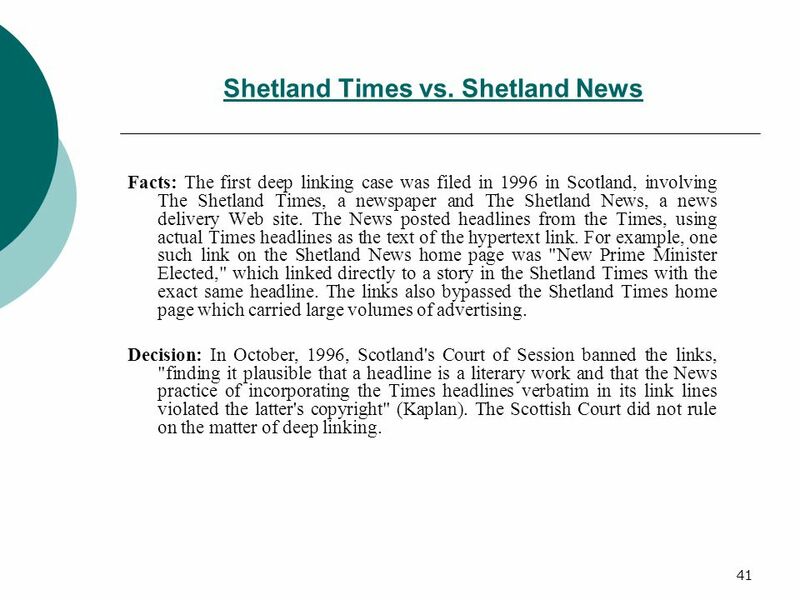 Facts: The first deep linking case was filed in 1996 in Scotland, involving The Shetland Times, a newspaper and The Shetland News, a news delivery Web site. The News posted headlines from the Times, using actual Times headlines as the text of the hypertext link. For example, one such link on the Shetland News home page was "New Prime Minister Elected," which linked directly to a story in the Shetland Times with the exact same headline. The links also bypassed the Shetland Times home page which carried large volumes of advertising. Decision: In October, 1996, Scotland's Court of Session banned the links, "finding it plausible that a headline is a literary work and that the News practice of incorporating the Times headlines verbatim in its link lines violated the latter's copyright" (Kaplan). The Scottish Court did not rule on the matter of deep linking. 42 The Washington Post Company et al. 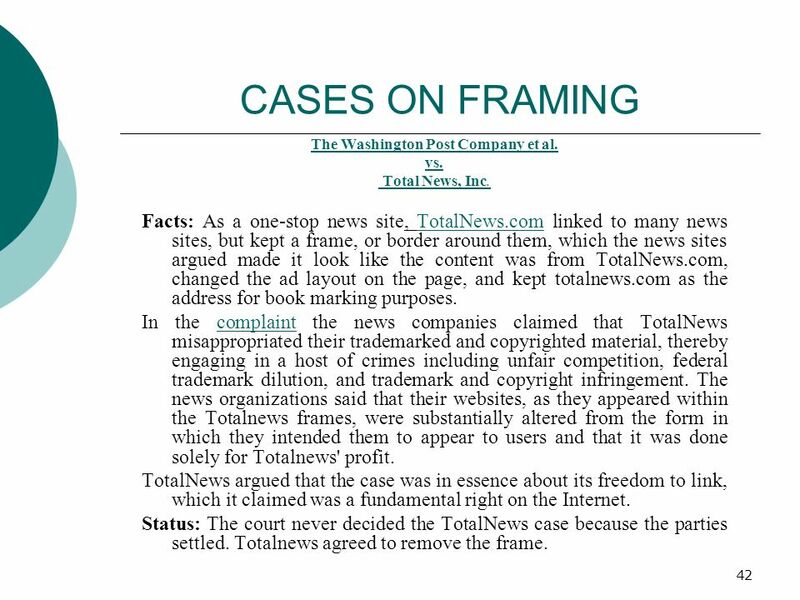 CASES ON FRAMING The Washington Post Company et al. vs. Total News, Inc. Facts: As a one-stop news site, TotalNews.com linked to many news sites, but kept a frame, or border around them, which the news sites argued made it look like the content was from TotalNews.com, changed the ad layout on the page, and kept totalnews.com as the address for book marking purposes. In the complaint the news companies claimed that TotalNews misappropriated their trademarked and copyrighted material, thereby engaging in a host of crimes including unfair competition, federal trademark dilution, and trademark and copyright infringement. The news organizations said that their websites, as they appeared within the Totalnews frames, were substantially altered from the form in which they intended them to appear to users and that it was done solely for Totalnews' profit. TotalNews argued that the case was in essence about its freedom to link, which it claimed was a fundamental right on the Internet. Status: The court never decided the TotalNews case because the parties settled. Totalnews agreed to remove the frame. 43 Hard Rock Café International (USA) Inc.
Framing Hard Rock Café International (USA) Inc. vs. Morton Facts: Peter Morton was a founder of the Hard Rock Café who sold his interests in the business to the parent company. Morton retained ownership of a Hard Rock Hotel and Casino and was granted a license to use certain service marks and trademarks. The parent company later sued Morton, claiming that he violated the license agreement by illegally framing the site to sell CDs. 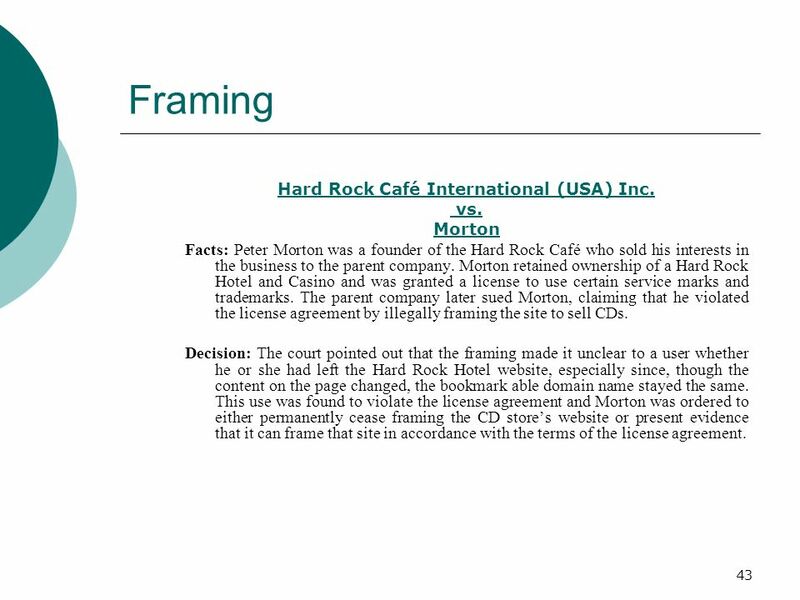 Decision: The court pointed out that the framing made it unclear to a user whether he or she had left the Hard Rock Hotel website, especially since, though the content on the page changed, the bookmark able domain name stayed the same. This use was found to violate the license agreement and Morton was ordered to either permanently cease framing the CD store’s website or present evidence that it can frame that site in accordance with the terms of the license agreement. 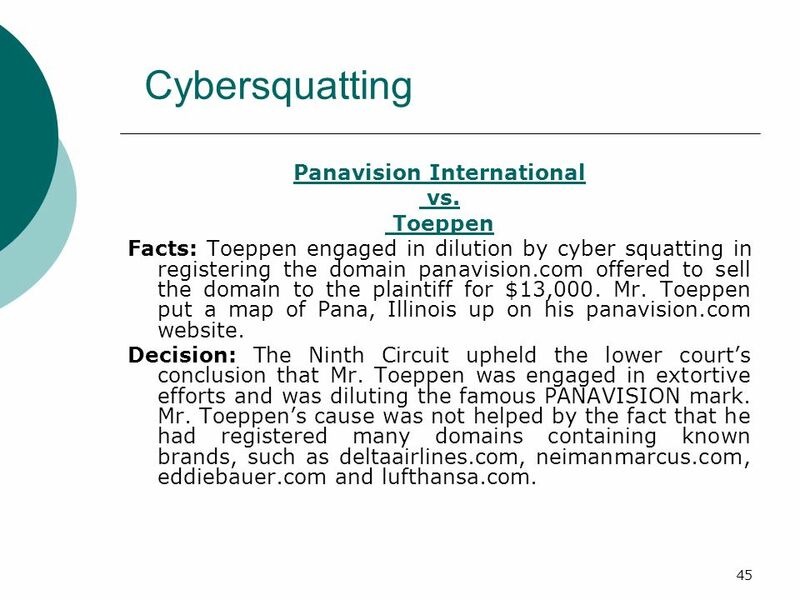 Cybersquatting Panavision International vs. Toeppen Facts: Toeppen engaged in dilution by cyber squatting in registering the domain panavision.com offered to sell the domain to the plaintiff for $13,000. Mr. Toeppen put a map of Pana, Illinois up on his panavision.com website. Decision: The Ninth Circuit upheld the lower court’s conclusion that Mr. Toeppen was engaged in extortive efforts and was diluting the famous PANAVISION mark. Mr. Toeppen’s cause was not helped by the fact that he had registered many domains containing known brands, such as deltaairlines.com, neimanmarcus.com, eddiebauer.com and lufthansa.com. 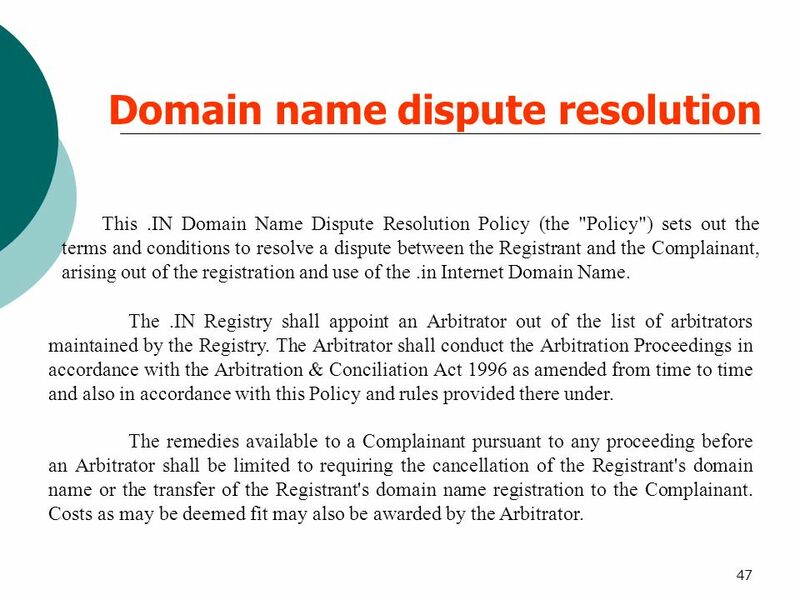 This .IN Domain Name Dispute Resolution Policy (the "Policy") sets out the terms and conditions to resolve a dispute between the Registrant and the Complainant, arising out of the registration and use of the .in Internet Domain Name. The .IN Registry shall appoint an Arbitrator out of the list of arbitrators maintained by the Registry. 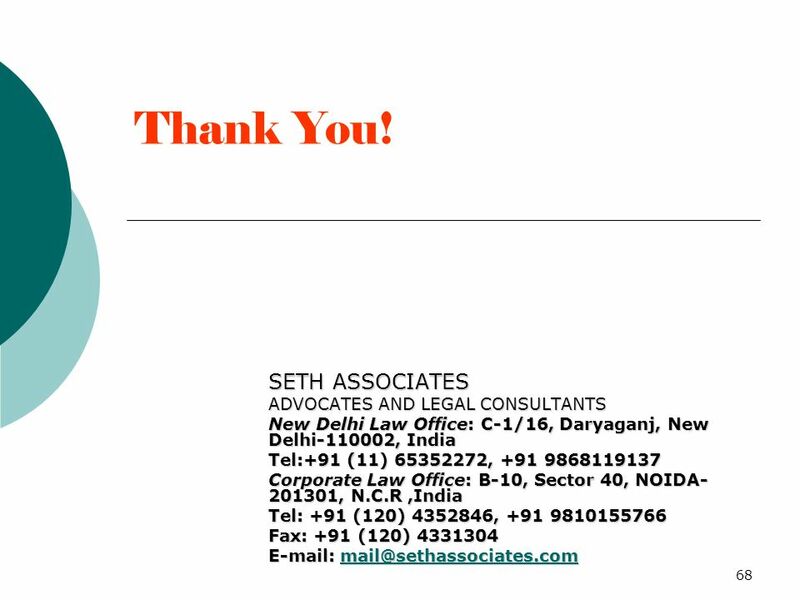 The Arbitrator shall conduct the Arbitration Proceedings in accordance with the Arbitration & Conciliation Act 1996 as amended from time to time and also in accordance with this Policy and rules provided there under. 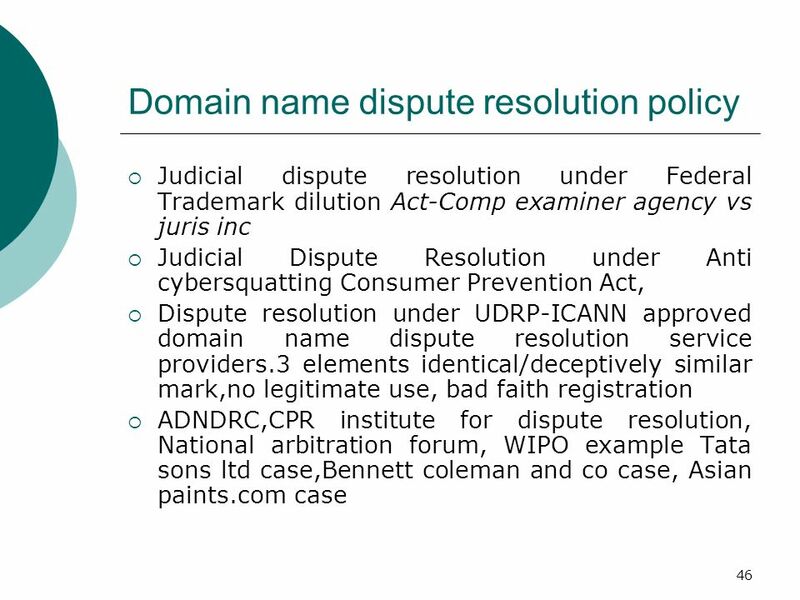 The remedies available to a Complainant pursuant to any proceeding before an Arbitrator shall be limited to requiring the cancellation of the Registrant's domain name or the transfer of the Registrant's domain name registration to the Complainant. Costs as may be deemed fit may also be awarded by the Arbitrator. There is some technology and logistical processes, of uncertain efficacy, in the pipeline that could result in extra-judicial prospective protection of software. 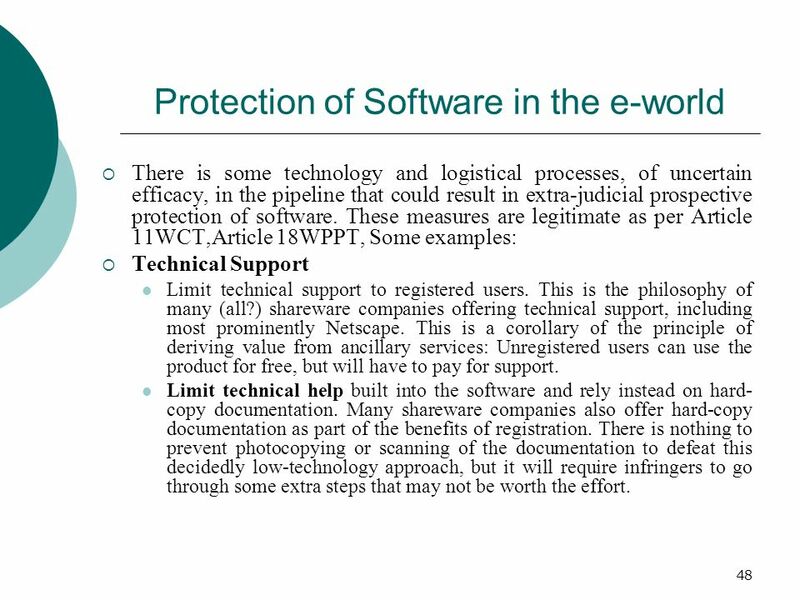 These measures are legitimate as per Article 11WCT,Article 18WPPT, Some examples: Technical Support Limit technical support to registered users. This is the philosophy of many (all?) shareware companies offering technical support, including most prominently Netscape. This is a corollary of the principle of deriving value from ancillary services: Unregistered users can use the product for free, but will have to pay for support. Limit technical help built into the software and rely instead on hard-copy documentation. Many shareware companies also offer hard-copy documentation as part of the benefits of registration. There is nothing to prevent photocopying or scanning of the documentation to defeat this decidedly low-technology approach, but it will require infringers to go through some extra steps that may not be worth the effort. "Super distribution" (Cox). 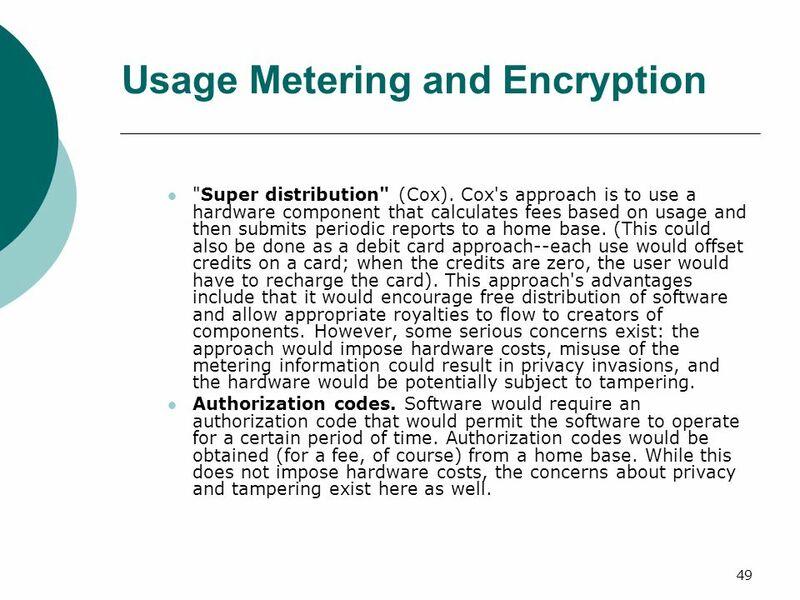 Cox's approach is to use a hardware component that calculates fees based on usage and then submits periodic reports to a home base. (This could also be done as a debit card approach--each use would offset credits on a card; when the credits are zero, the user would have to recharge the card). 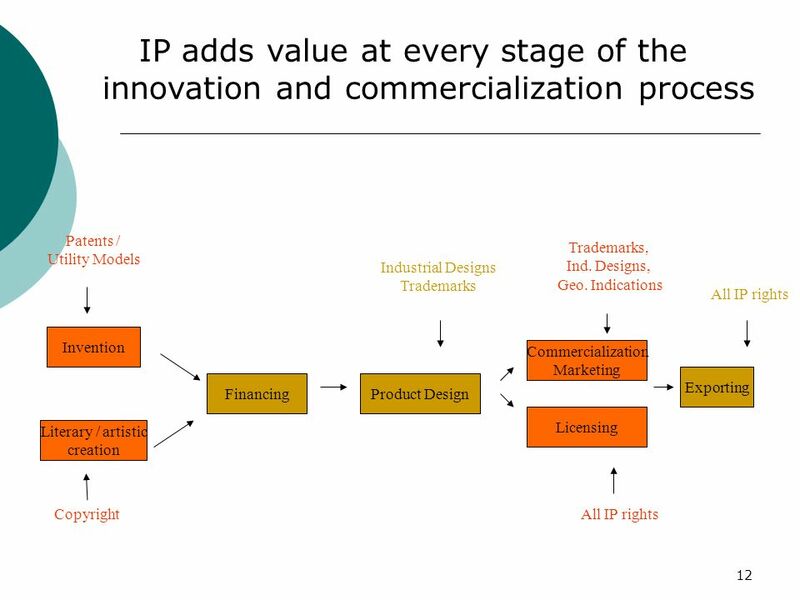 This approach's advantages include that it would encourage free distribution of software and allow appropriate royalties to flow to creators of components. However, some serious concerns exist: the approach would impose hardware costs, misuse of the metering information could result in privacy invasions, and the hardware would be potentially subject to tampering. Authorization codes. Software would require an authorization code that would permit the software to operate for a certain period of time. Authorization codes would be obtained (for a fee, of course) from a home base. While this does not impose hardware costs, the concerns about privacy and tampering exist here as well. 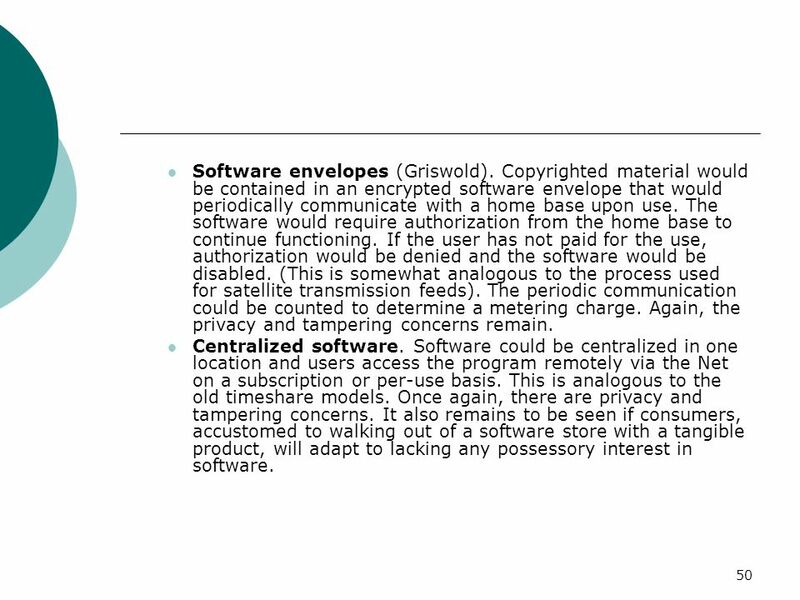 Software envelopes (Griswold). Copyrighted material would be contained in an encrypted software envelope that would periodically communicate with a home base upon use. The software would require authorization from the home base to continue functioning. If the user has not paid for the use, authorization would be denied and the software would be disabled. (This is somewhat analogous to the process used for satellite transmission feeds). The periodic communication could be counted to determine a metering charge. Again, the privacy and tampering concerns remain. Centralized software. Software could be centralized in one location and users access the program remotely via the Net on a subscription or per-use basis. This is analogous to the old timeshare models. Once again, there are privacy and tampering concerns. It also remains to be seen if consumers, accustomed to walking out of a software store with a tangible product, will adapt to lacking any possessory interest in software. 51 Note that in the metering models, there will be a tremendous increase in the amount of information transmitted back and forth on the Net. These transmission demands will create costs that must be borne by someone--ultimately, the user. Software-based controls Limited functionality programs. These are frequently used in software programs today, with limits such as disabled printing and saving or "time bombs." Chances are that these limited functionality approaches will merge with the metering approaches described above, since the Net will be an efficient way to remove the limits. As with the other proposals, these are subject to tampering. Build "bugs" into the software, requiring users to get updated, bug-free versions (suggested and rejected by Dyson). This is a crude way to disable software and likely to produce ill-will. Furthermore, without other protections there is nothing to prevent the dissemination of the non-buggy versions once released. Copy protection. Among other approaches, software could have a sensor that causes the software to self-destruct if user tries to copy (Barlow). While highly effective when it works, copy protection has fallen into disfavor with consumers and is rarely seen now. 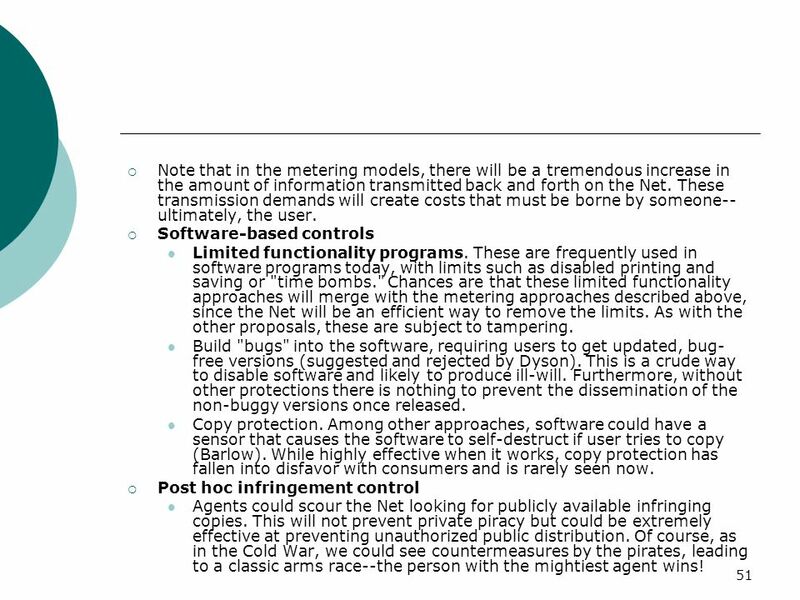 Post hoc infringement control Agents could scour the Net looking for publicly available infringing copies. This will not prevent private piracy but could be extremely effective at preventing unauthorized public distribution. Of course, as in the Cold War, we could see countermeasures by the pirates, leading to a classic arms race--the person with the mightiest agent wins! 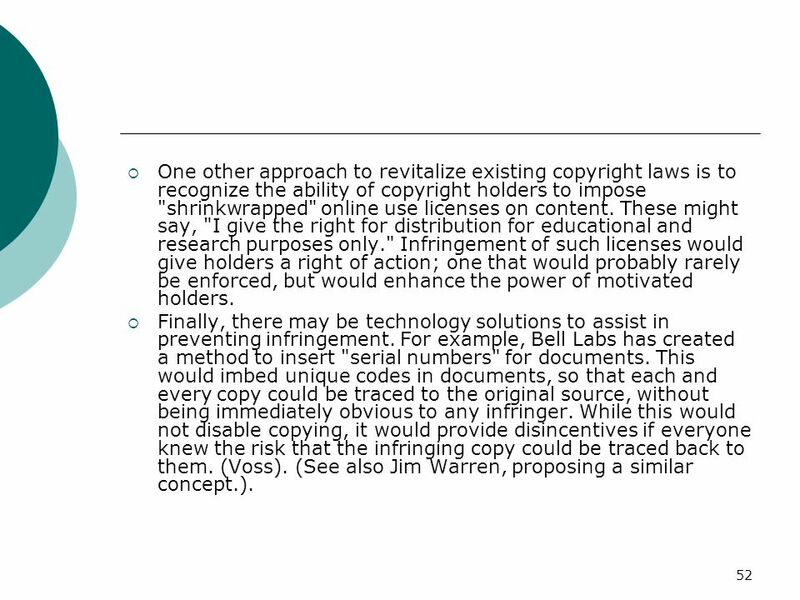 52 One other approach to revitalize existing copyright laws is to recognize the ability of copyright holders to impose "shrinkwrapped" online use licenses on content. These might say, "I give the right for distribution for educational and research purposes only." Infringement of such licenses would give holders a right of action; one that would probably rarely be enforced, but would enhance the power of motivated holders. Finally, there may be technology solutions to assist in preventing infringement. For example, Bell Labs has created a method to insert "serial numbers" for documents. This would imbed unique codes in documents, so that each and every copy could be traced to the original source, without being immediately obvious to any infringer. While this would not disable copying, it would provide disincentives if everyone knew the risk that the infringing copy could be traced back to them. (Voss). (See also Jim Warren, proposing a similar concept.). 53 The CSS and DeCSS CSS- Content Scramble system is an access control and copy prevention system for DVDs developed by motion picture studios. Encryption based system. 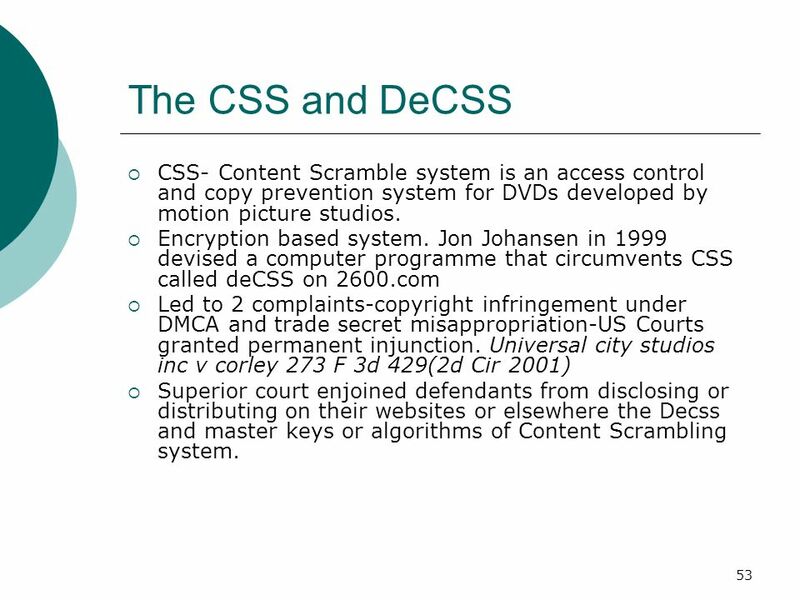 Jon Johansen in 1999 devised a computer programme that circumvents CSS called deCSS on 2600.com Led to 2 complaints-copyright infringement under DMCA and trade secret misappropriation-US Courts granted permanent injunction. 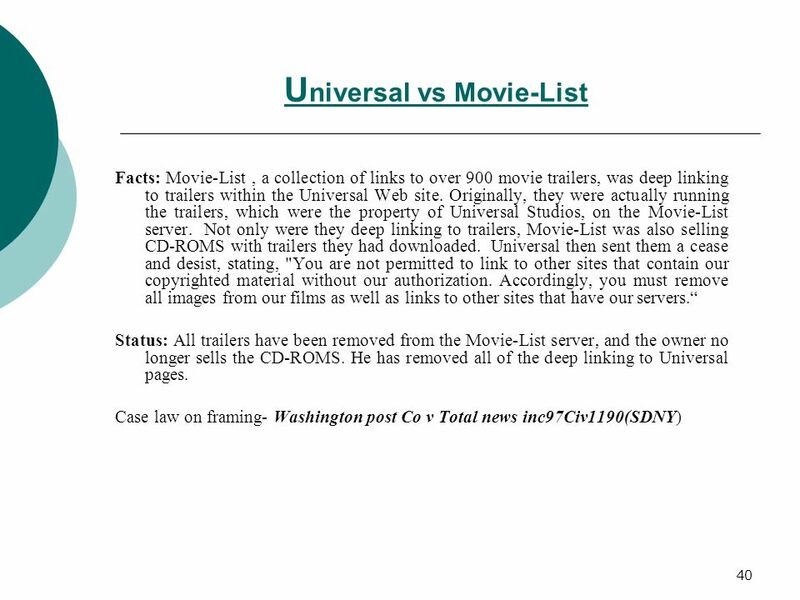 Universal city studios inc v corley 273 F 3d 429(2d Cir 2001) Superior court enjoined defendants from disclosing or distributing on their websites or elsewhere the Decss and master keys or algorithms of Content Scrambling system. 55 Database Protection Copyright protection to tables, compilations and computer databases does not extend to any data itself, but only to the way in which it is organized. 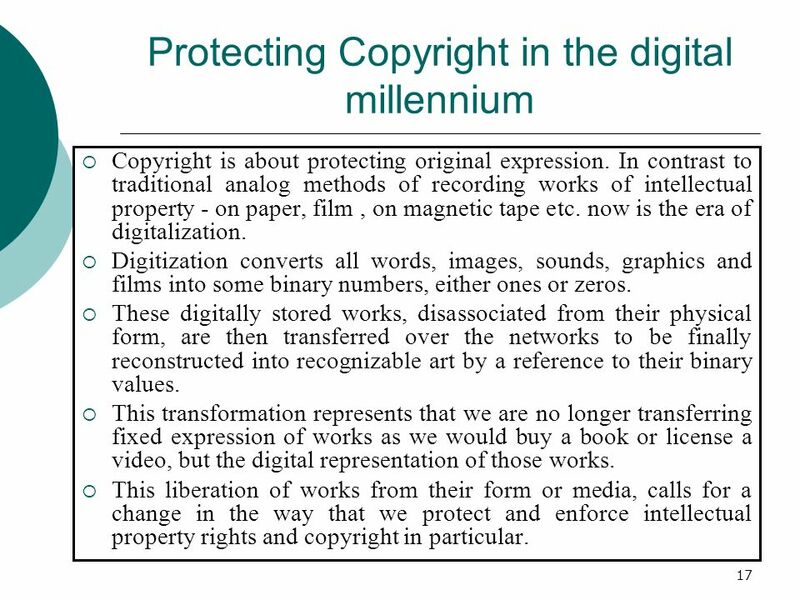 This fundamental copyright principle is expressed in Article 10.2 of the TRIPS Agreement: Compilations of data or other material, whether in machine readable or other form, which by reason of the selection or arrangement of their contents constitute intellectual creations shall be protected as such. 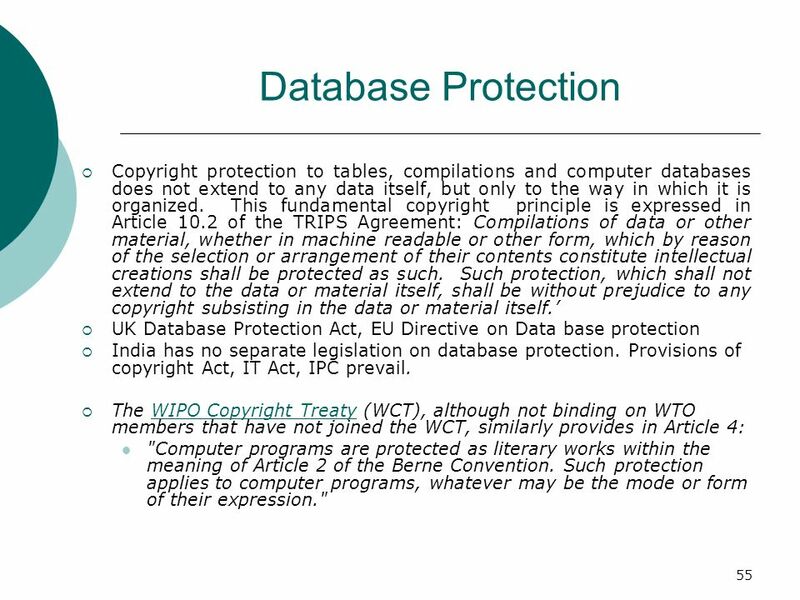 Such protection, which shall not extend to the data or material itself, shall be without prejudice to any copyright subsisting in the data or material itself.’ UK Database Protection Act, EU Directive on Data base protection India has no separate legislation on database protection. 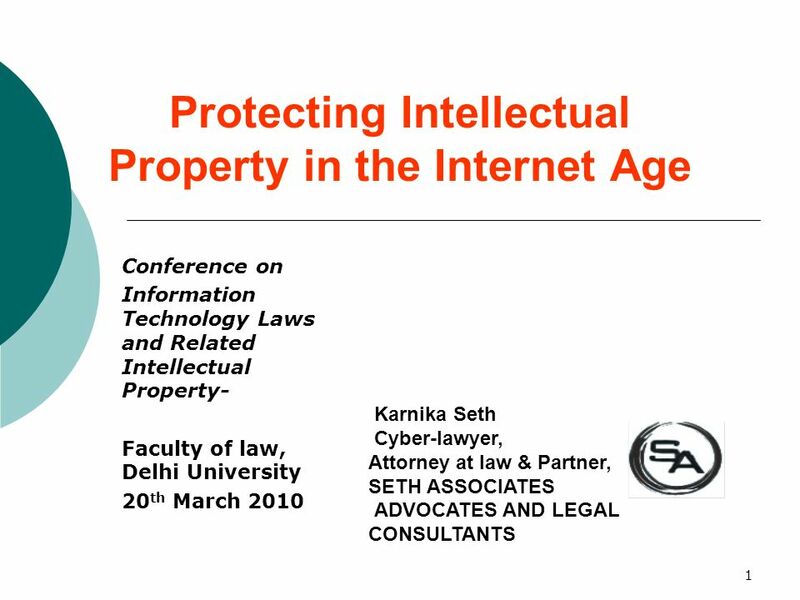 Provisions of copyright Act, IT Act, IPC prevail. The WIPO Copyright Treaty (WCT), although not binding on WTO members that have not joined the WCT, similarly provides in Article 4: "Computer programs are protected as literary works within the meaning of Article 2 of the Berne Convention. Such protection applies to computer programs, whatever may be the mode or form of their expression." 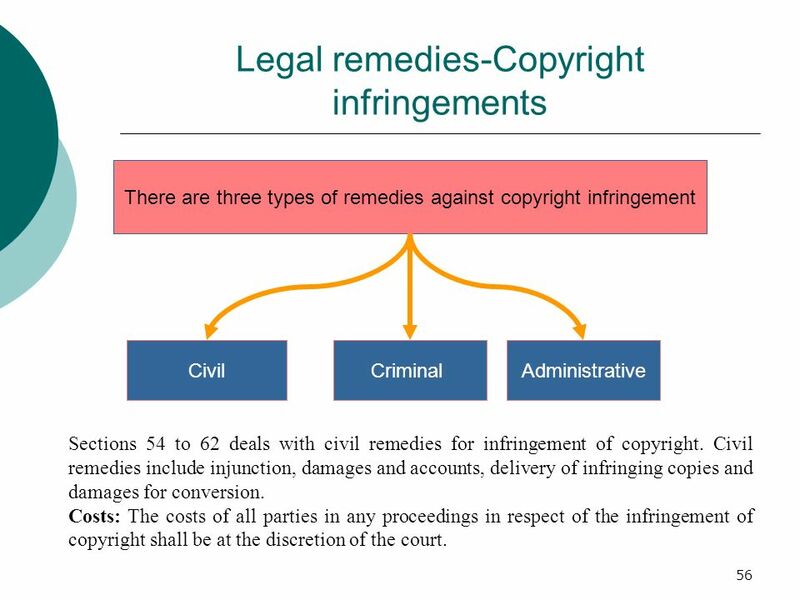 There are three types of remedies against copyright infringement Civil Criminal Administrative Sections 54 to 62 deals with civil remedies for infringement of copyright. Civil remedies include injunction, damages and accounts, delivery of infringing copies and damages for conversion. Costs: The costs of all parties in any proceedings in respect of the infringement of copyright shall be at the discretion of the court. 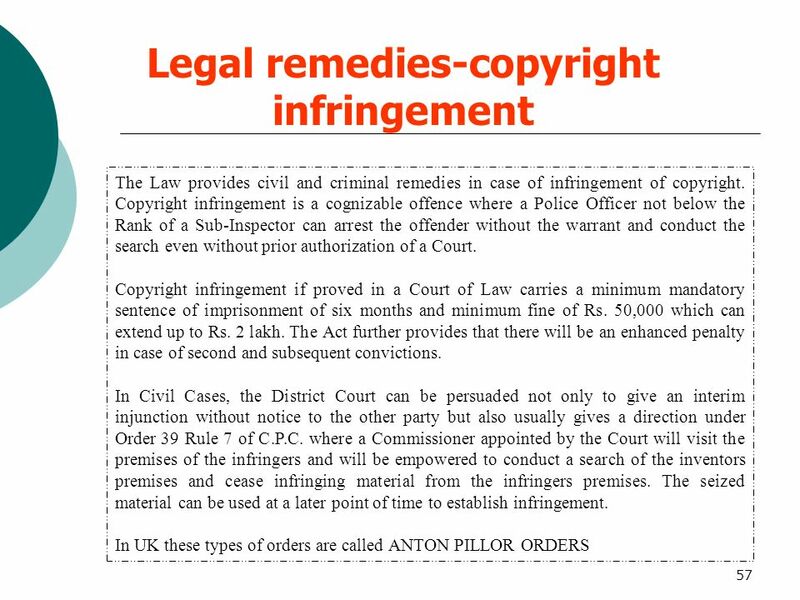 58 Section 63 defines what constitutes a criminal offence-copyright infringements. 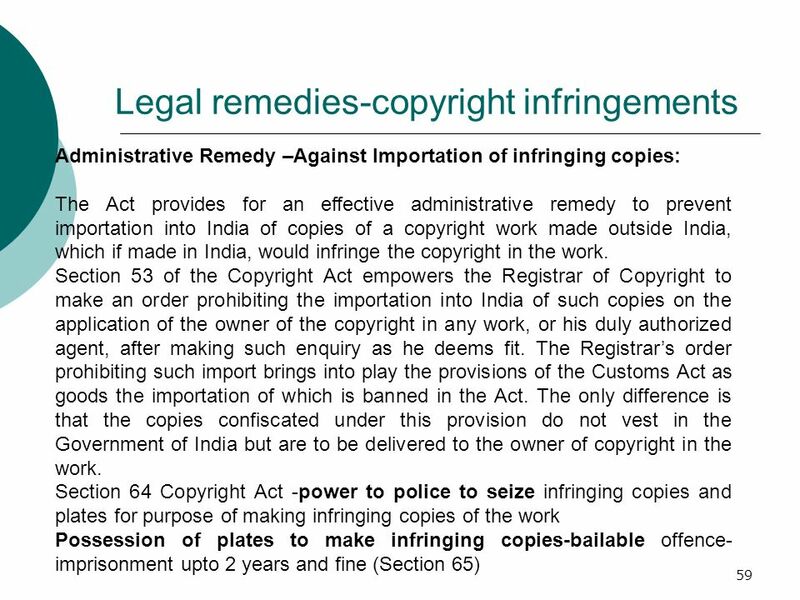 Any person who knowingly infringes or abets the infringement of- the copyright in a work, or any other right conferred by the Act (except the right conferred by section 53A, which is the right to share in the resale price of the original copy will be punished with imprisonment for a minimum term of six months and a maximum of three years and with a fine which may vary from a minimum of 50,000 rupees to two lakh rupees. Kind of Infringement Relief Copy in a work will be considered infringed- 1. when any person, without a licence granted by the owner of the copyright, or the Registrar of Copyrights, or in contravention of the conditions of a licence so granted, or of any condition imposed by a competent authority- i.	does anything, the exclusive right to do which is by this Act conferred upon the owner of the copyright, or ii. permits for profit any place to be used for the communication of the work to the public where such communication constitutes an infringement of the copyright in the work, unless he was not aware and had no reasonable ground for beleiveing that such communication to the public would be an infringement of the copyright; or Civil Remedies: Injunction Damages Account of profit Delivery of infringing copies Damages for conversion Criminal Remedies: Imprisonment of the accused or imposition of fine or both Seizure of infringing copies. Kind of Infringement Relief 2. when any person- i.	makes for sale or hire, or sells or lets for hire, or by way of trade displays or offers for sale or hire, or ii. 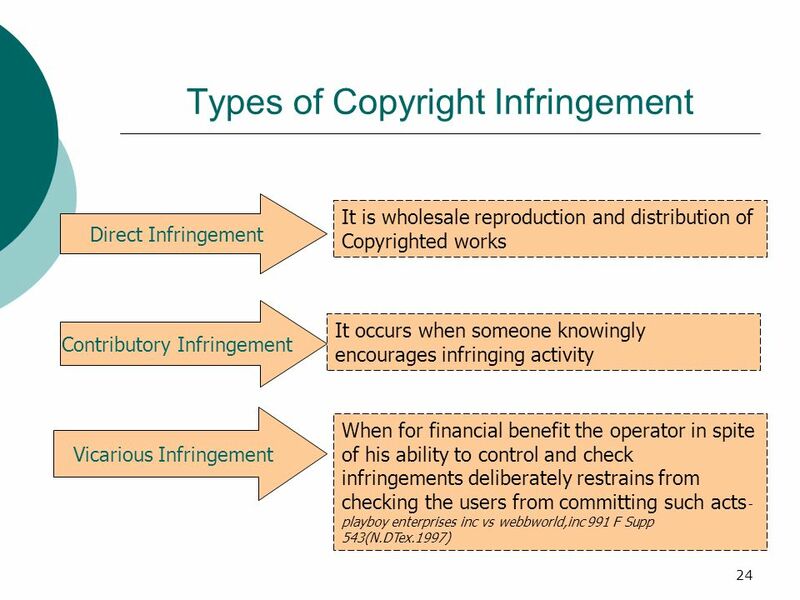 distributes either for the purpose of trade or to such an extent as to affect prejudicially the owner of the copyright, or iii. by way of trade exhibits in public, or iv. 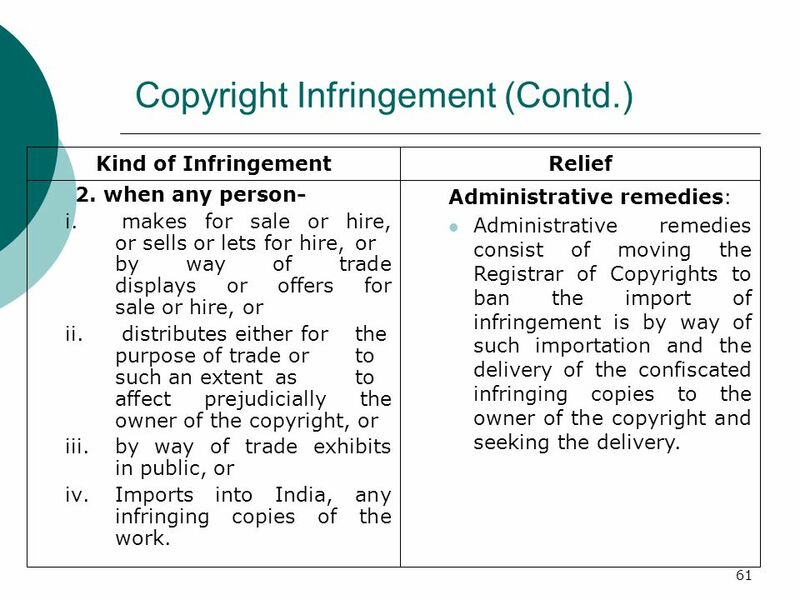 Imports into India, any infringing copies of the work. Administrative remedies: Administrative remedies consist of moving the Registrar of Copyrights to ban the import of infringement is by way of such importation and the delivery of the confiscated infringing copies to the owner of the copyright and seeking the delivery. Kind of Infringement Relief The taking of any essential feature of the mark or taking the whole of the mark and then making a few additions and alterations would constitute infringement. 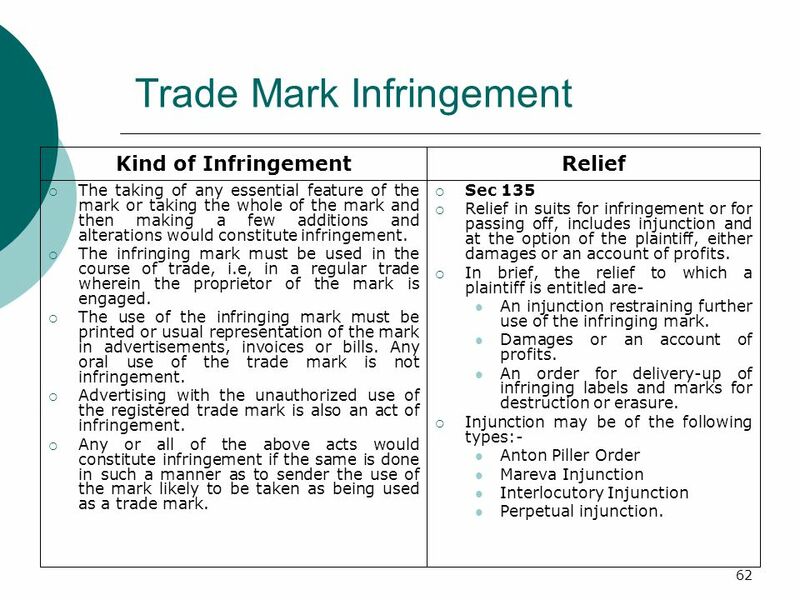 The infringing mark must be used in the course of trade, i.e, in a regular trade wherein the proprietor of the mark is engaged. The use of the infringing mark must be printed or usual representation of the mark in advertisements, invoices or bills. Any oral use of the trade mark is not infringement. Advertising with the unauthorized use of the registered trade mark is also an act of infringement. Any or all of the above acts would constitute infringement if the same is done in such a manner as to sender the use of the mark likely to be taken as being used as a trade mark. Sec 135 Relief in suits for infringement or for passing off, includes injunction and at the option of the plaintiff, either damages or an account of profits. In brief, the relief to which a plaintiff is entitled are- An injunction restraining further use of the infringing mark. Damages or an account of profits. An order for delivery-up of infringing labels and marks for destruction or erasure. Injunction may be of the following types:- Anton Piller Order Mareva Injunction Interlocutory Injunction Perpetual injunction. 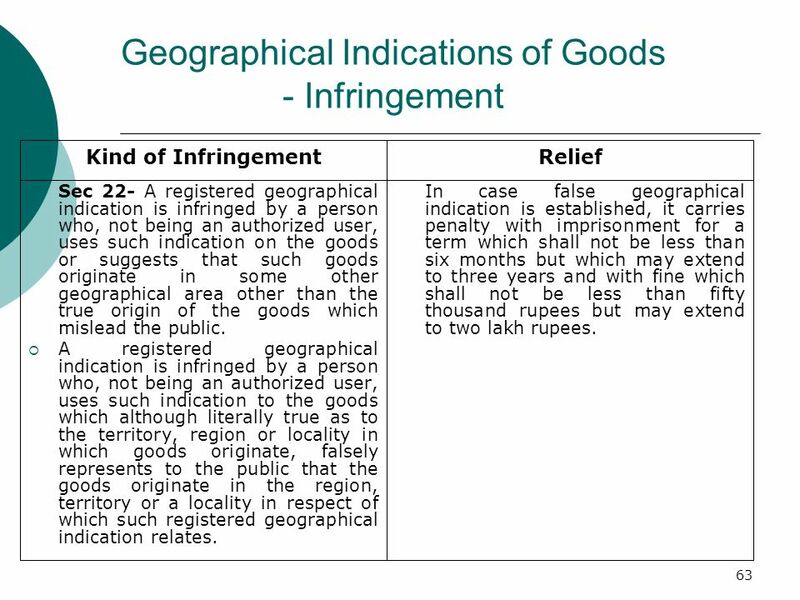 Kind of Infringement Relief Sec 22- A registered geographical indication is infringed by a person who, not being an authorized user, uses such indication on the goods or suggests that such goods originate in some other geographical area other than the true origin of the goods which mislead the public. A registered geographical indication is infringed by a person who, not being an authorized user, uses such indication to the goods which although literally true as to the territory, region or locality in which goods originate, falsely represents to the public that the goods originate in the region, territory or a locality in respect of which such registered geographical indication relates. In case false geographical indication is established, it carries penalty with imprisonment for a term which shall not be less than six months but which may extend to three years and with fine which shall not be less than fifty thousand rupees but may extend to two lakh rupees. 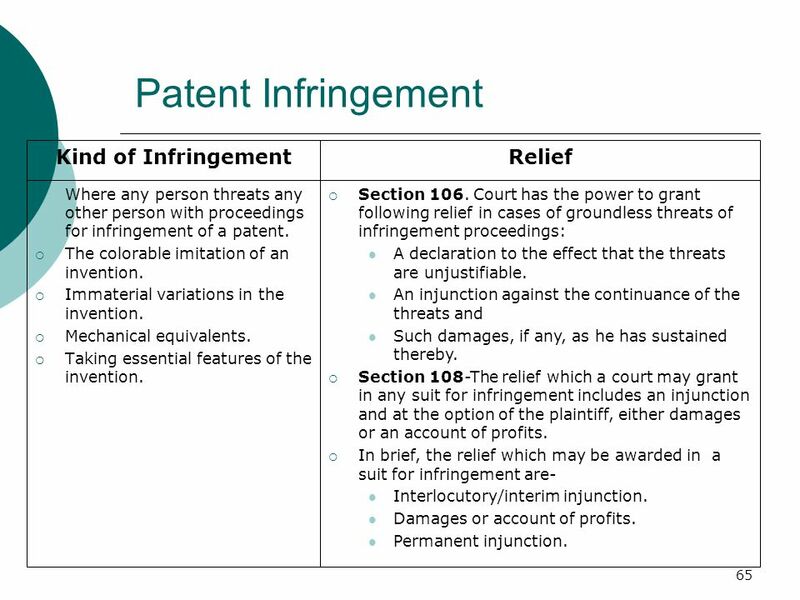 Where any person threats any other person with proceedings for infringement of a patent. The colorable imitation of an invention. Immaterial variations in the invention. Mechanical equivalents. Taking essential features of the invention. Section 106. Court has the power to grant following relief in cases of groundless threats of infringement proceedings: A declaration to the effect that the threats are unjustifiable. An injunction against the continuance of the threats and Such damages, if any, as he has sustained thereby. 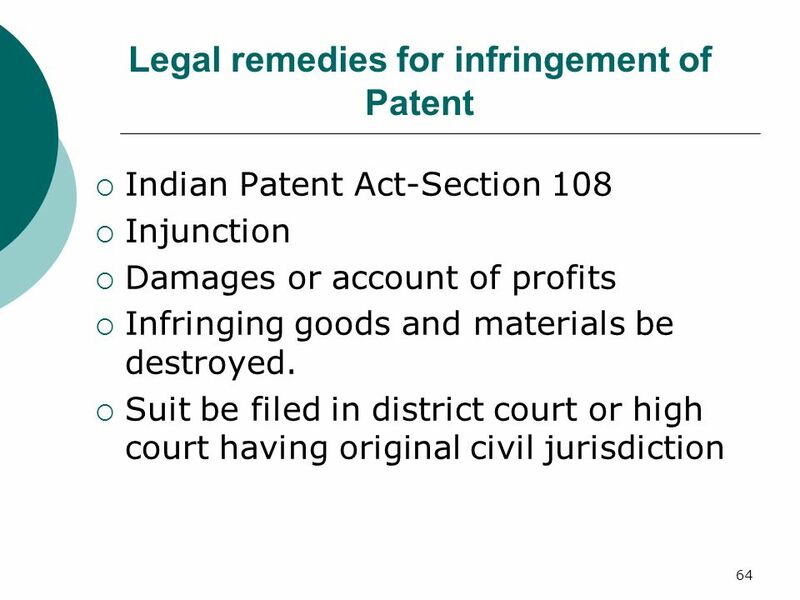 Section 108-The relief which a court may grant in any suit for infringement includes an injunction and at the option of the plaintiff, either damages or an account of profits. In brief, the relief which may be awarded in a suit for infringement are- Interlocutory/interim injunction. Damages or account of profits. Permanent injunction. Sec 22- lays down that the following acts amount to piracy- To publish or to have it published or expose for sale any article of the class in question on which either the design or any fraudulent or obvious imitation has been applied. To either apply or cause to apply the design that is registered to any class of goods covered by the registration, the design or any imitation of it. To import for the purpose of sale any article belonging to the class in which the design has been registered and to which the design or a fraudulent or obvious imitation thereof has been applied. 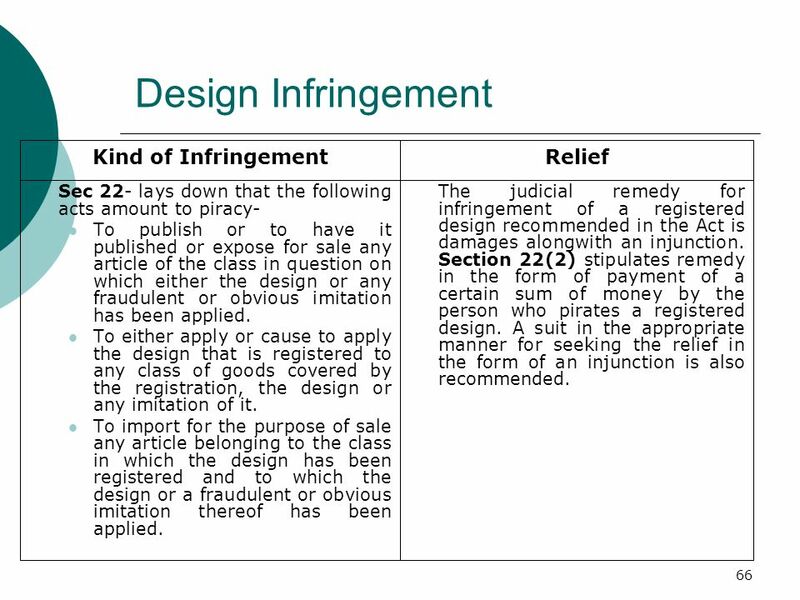 The judicial remedy for infringement of a registered design recommended in the Act is damages alongwith an injunction. Section 22(2) stipulates remedy in the form of payment of a certain sum of money by the person who pirates a registered design. A suit in the appropriate manner for seeking the relief in the form of an injunction is also recommended. 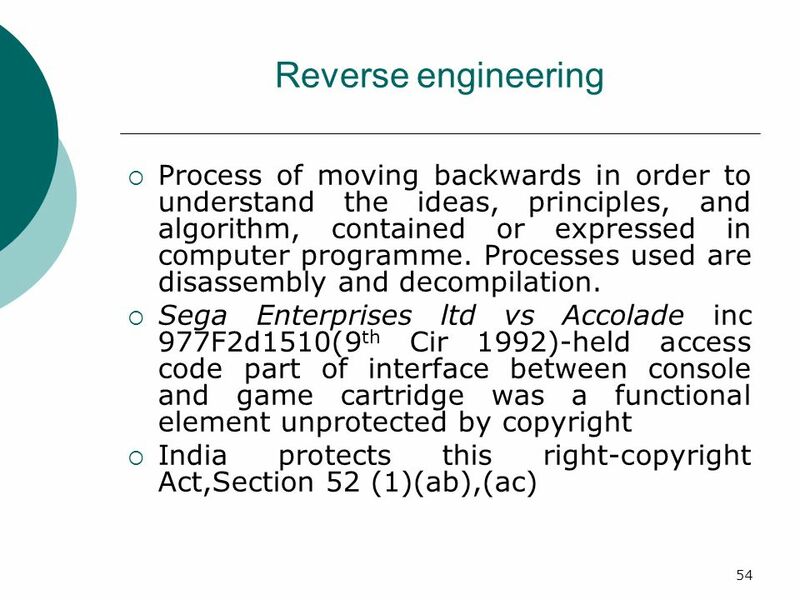 Kind of Infringement Relief According to Section 18, a person who- does any act of reproducing, whether by incorporating in a semiconductor integrated circuit or otherwise, a registered layout-design in its entirety or any part thereof, except such act of reproducing any part thereof which is not original. 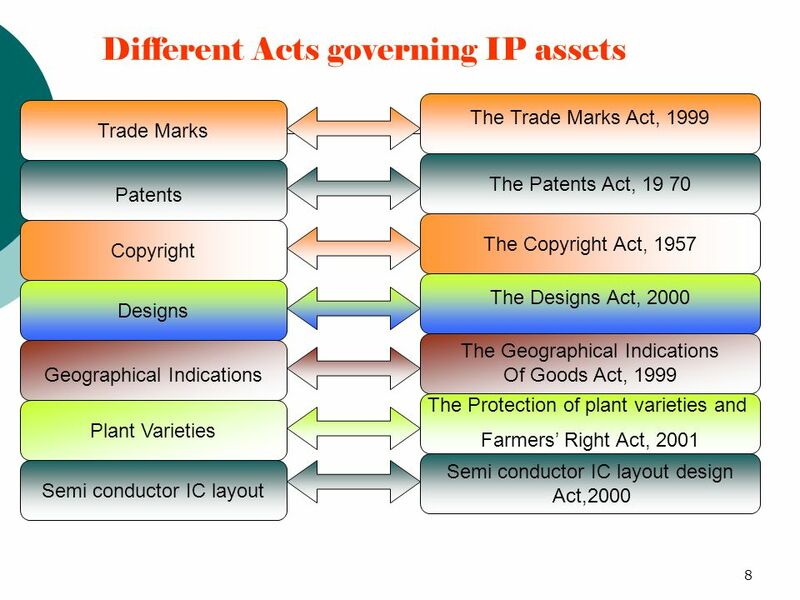 does any act of importing or selling or otherwise distributing for commercial purposes a registered layout-design or a semiconductor integrated circuit incorporating such registered layout-design or an article incorporating such a semiconductor integrated circuit containing such registered layout-design for the use of which such person is not entitled under this Act. Any person who infringes the right of registered proprietor shall be punishable with imprisonment for a term which may be extended to three years, or with fine which shall not be less than fifty thousand rupees but which may extend to ten lakh rupees, or with both under section 56 of the Act. 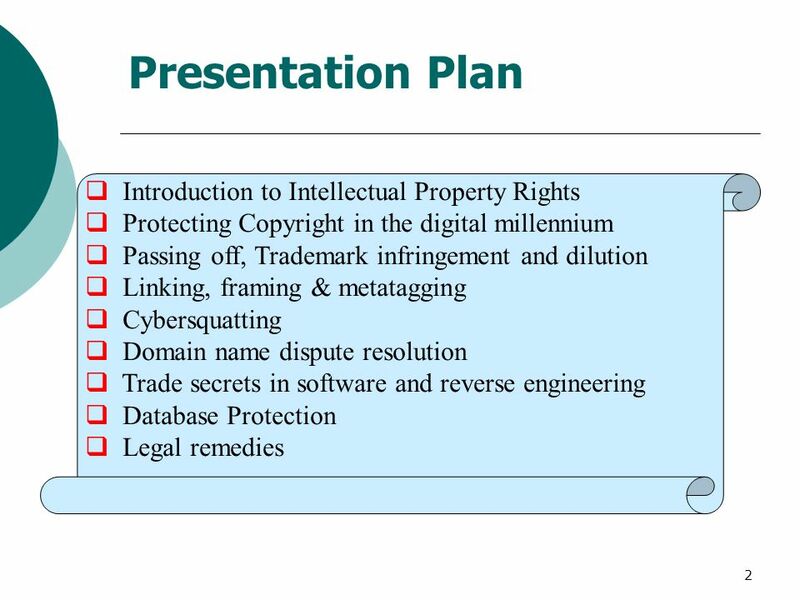 Download ppt "Protecting Intellectual Property in the Internet Age"
1 DIGITAL INTERACTIVE MEDIA Wednesday, October 28, 2009. 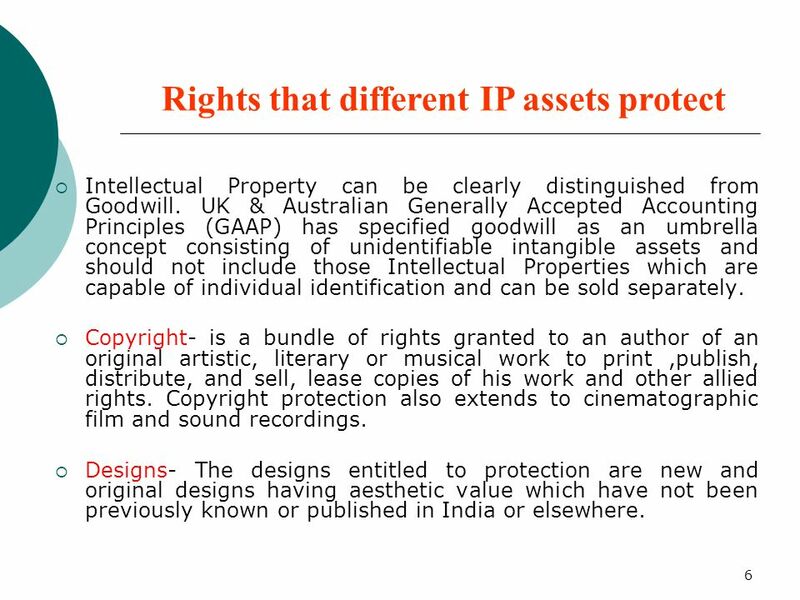 ACCESS TO PROTECTED WORKS: LIMITS OF PARALLEL IMPORTS By Nisha C. Vishnu Sankar P.
Copyright- meaning thereof As per Black Law’s dictionary, Copyright is the right of literary property as recognized and sanctioned by positive law. Copyright. Laws applicable to Trade Mark Common law Legislation - Trade Marks Act 1976 and Trade Marks Regulations Trade Descriptions Act 1972 P.
1 Introduction to Software Engineering Lecture 38 – Intellectual Property. Copyright Myths. "If it doesn't have a copyright notice, it's not copyrighted." This was true in the past, but today almost all major nations follow the. 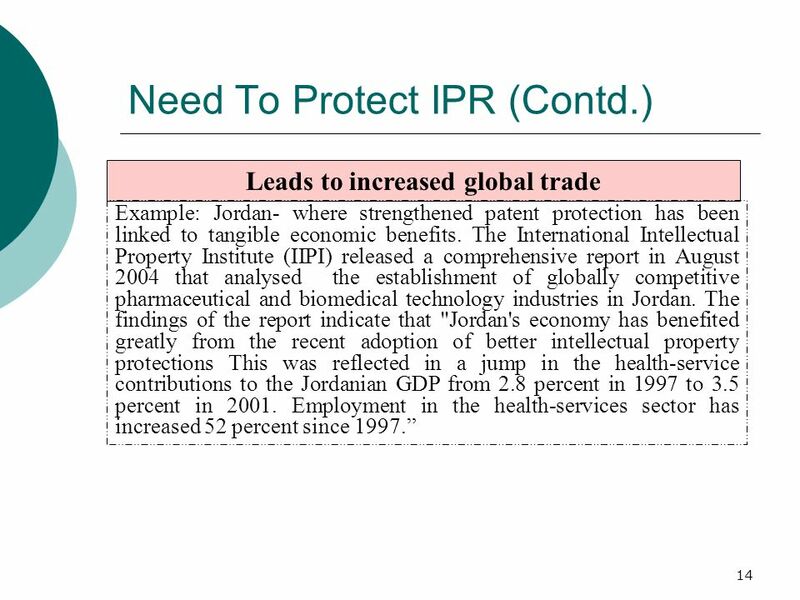 Protecting Intellectual Property (IP) Evan Kuenzli Grant Miller.